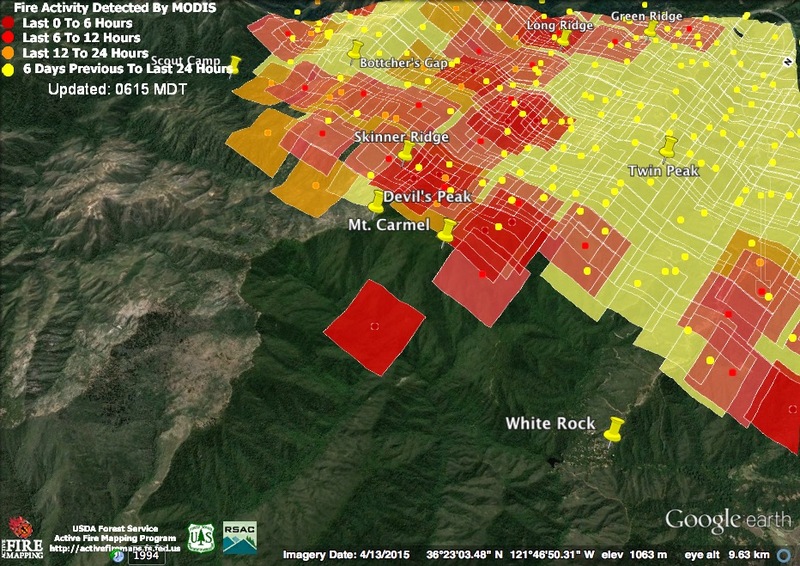 The fire was highly active from the northern slopes of Mt. 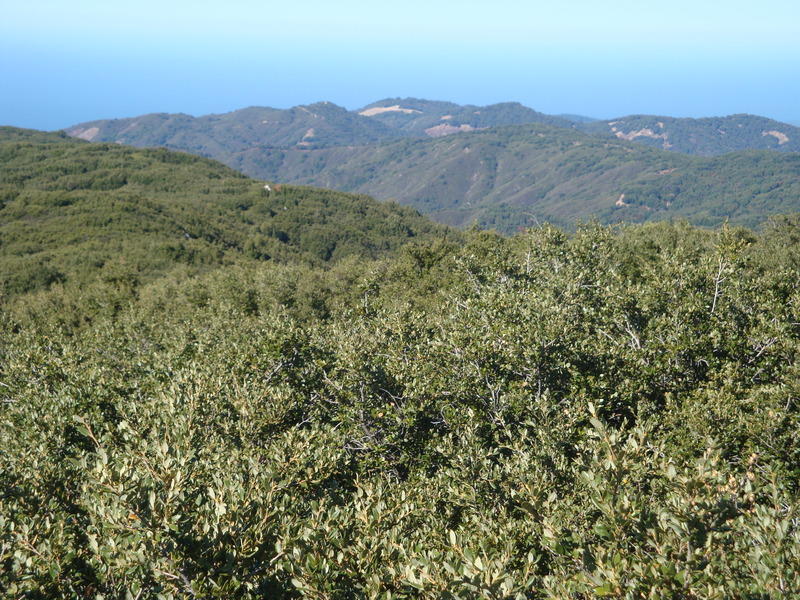 Carmel (overlooking the White Rock community) across the headwaters of Pine Creek, over Devil’s Peak, out into the Little Sur Basin throughout the Comings Cabin area and beyond, and down Skinner Ridge to the Scout Camp. 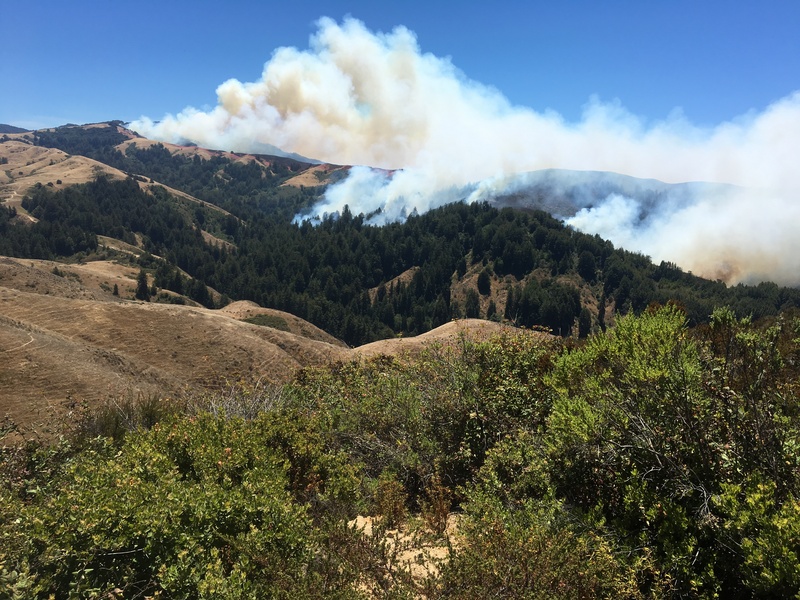 There is still no indication of fire south of the North Fork Little Sur, but fire is obviously well established outside the hoped-for containment lines on Skinner Ridge. The light red squares were recorded around noon and the dark red squares at about 1:30pm. The official numbers: 29,877 acres; 15% containment; 41 homes and 10 outbuildings burned; 2 homes and 2 outbuildings damaged. Looks like the fire had a relatively quite night. The new heat detections all come from a satellite pass at around 10:30 pm last night. The second satellite pass, which presumably occurred in the early am, apparently found nothing. This suggests that the fire was mostly smoldering rather than running in the early morning hours, which is a welcome change. That being said, reports from the ground suggest that fire remained active last night in Palo Colorado and other coastal canyons and that many homes in those areas remain threatened. 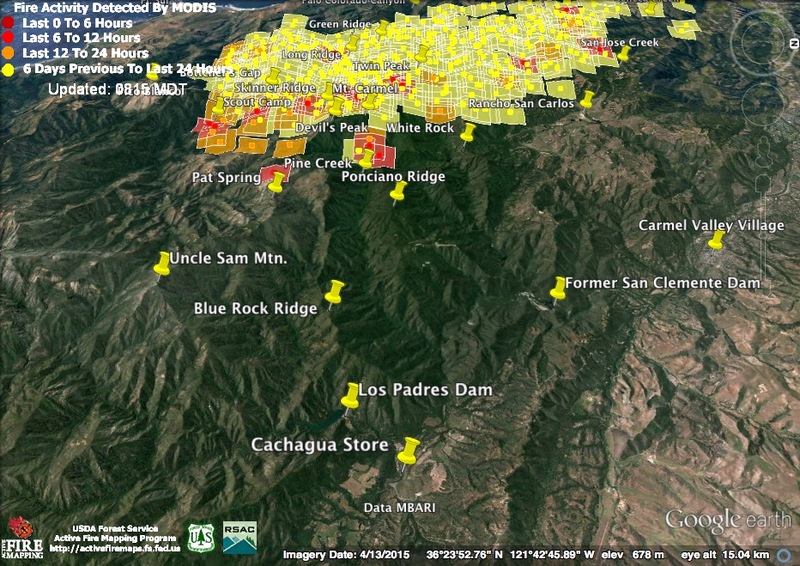 The fire line facing the Ventana Wilderness may be the lowest priority when it comes to protecting property, but if these heat detections are correct, it is becoming the biggest challenge to containment. Heat detected at 10:30 pm last night suggests a fire front continuing to move, outside the containment lines, along the ridge toward Pat Spring. This morning’s Operations Map, while it has not been updated to reflect this new movement, does show quite a bit of fire over the Skinner Ridge line. 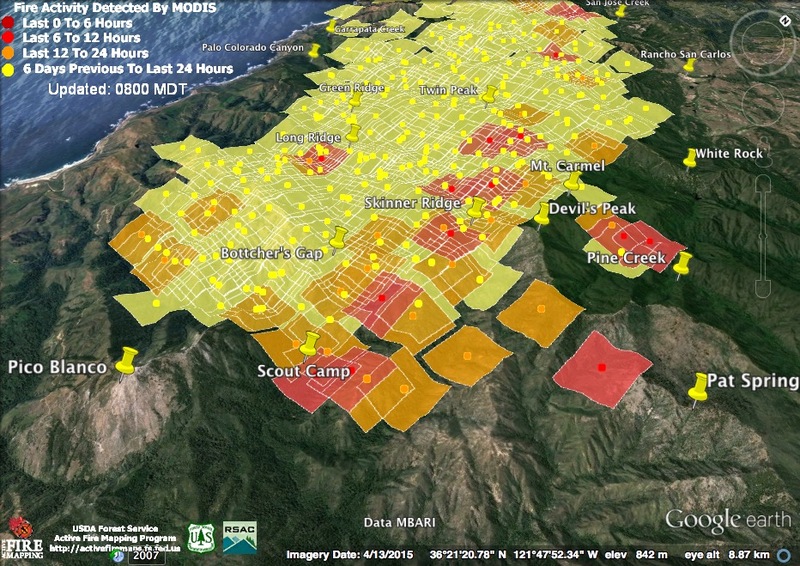 More heat was also detected in the vicinity of the Scout Camp. These are both areas that burned only 8 years ago in the 2008 Basin Complex Fire. 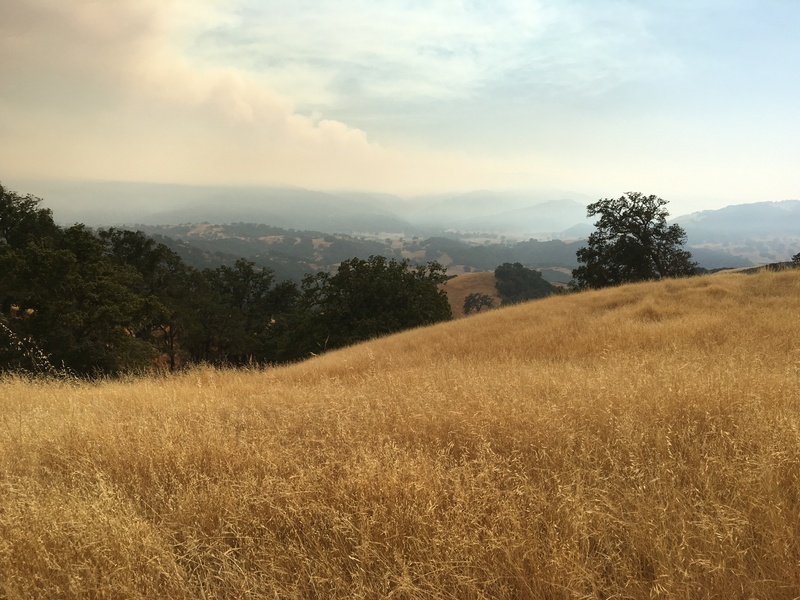 The landscape recovers its ability to carry fire very quickly in the Santa Lucia mountains – which is one reason why controlled burning programs probably wouldn’t do much to reduce fire danger in this area. 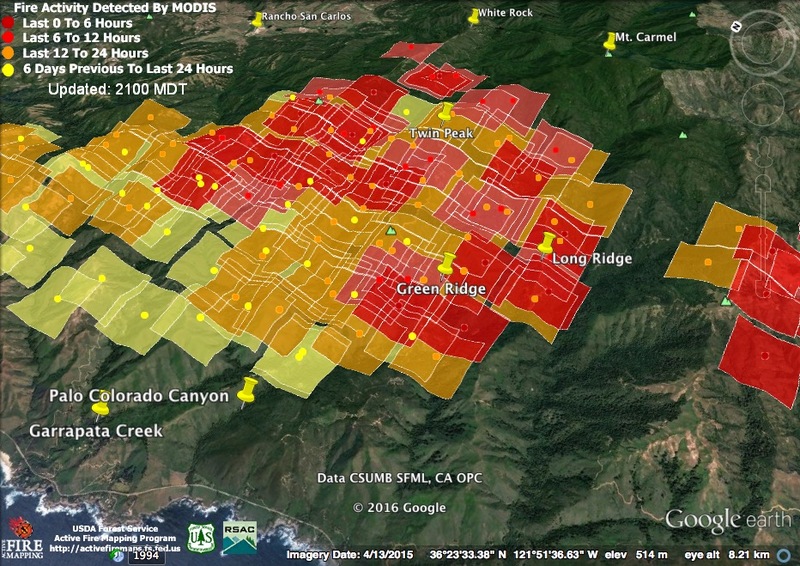 Notice, in the background, that the satellite found evidence of a fire front moving down Ponciano Ridge, above Pine Creek. The only heat detected overnight on the northern fire perimeter was in the vicinity of the Mitteldorf Preserve, near San Jose Creek. 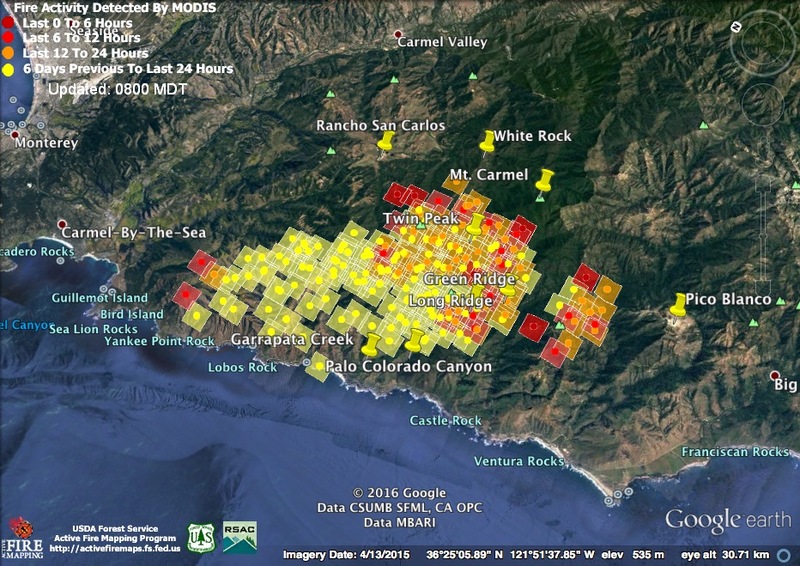 A lot of people have been asking where the fire is in relation to Cachagua and Carmel Valley. The answer is that it’s still pretty far away, as I hope this map makes clear. Containment lines are being built, though, that would allow the fire, if necessary, to burn all the way down to, and even across, the Carmel River, just upstream of the former San Clemente Dam. The official numbers: 27,326 acres; containment 10%; 34 homes and 10 outbuildings burned; 2 homes and 2 outbuildings damaged. As before, this does not mean that almost 4,000 additional acres burned overnight. Just that mapping is catching up with what’s burned over the past couple of days. 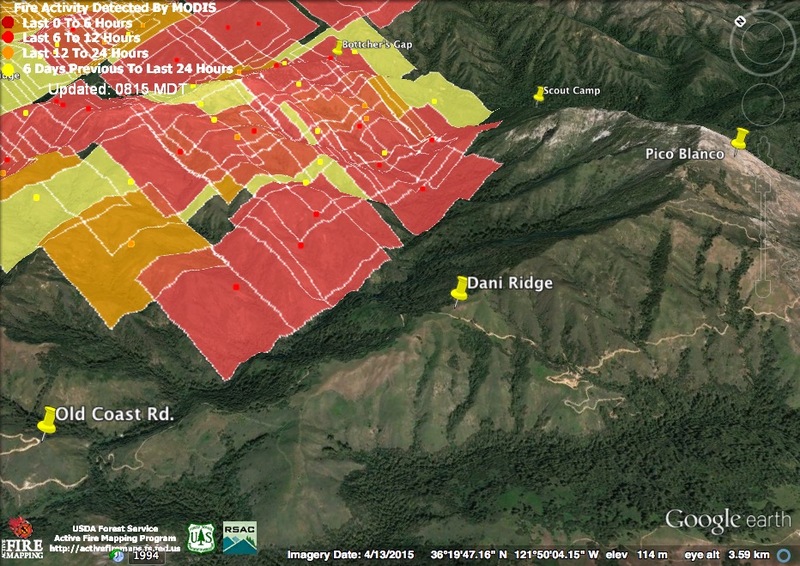 Click here to view an infrared map of fire location and intensity from 9:39 pm last night. 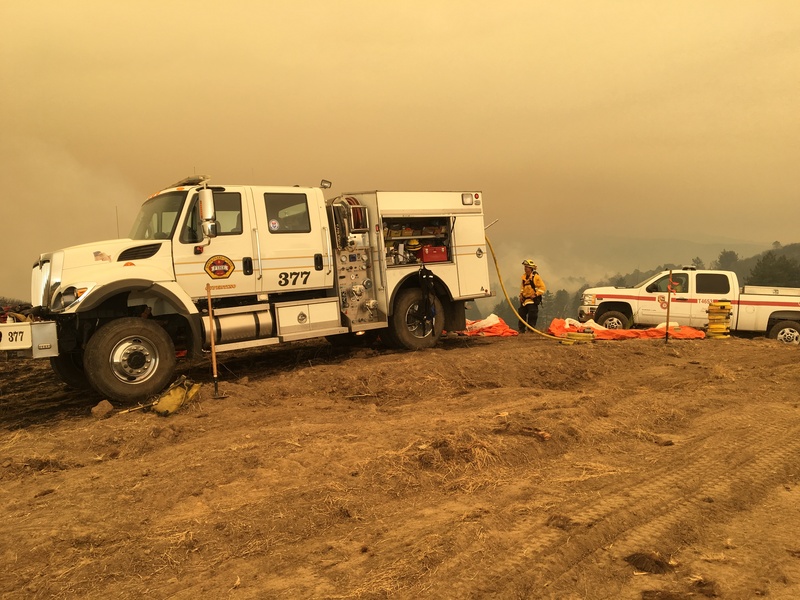 An especially sad day as news came of the death last night of a young dozer operator working to save homes in the Palo Colorado area. Today’s daytime satellite passes, at around 11:30 am and 2:30 pm, failed to detect new heat at the north end of the fire and along the front facing Rancho San Carlos. 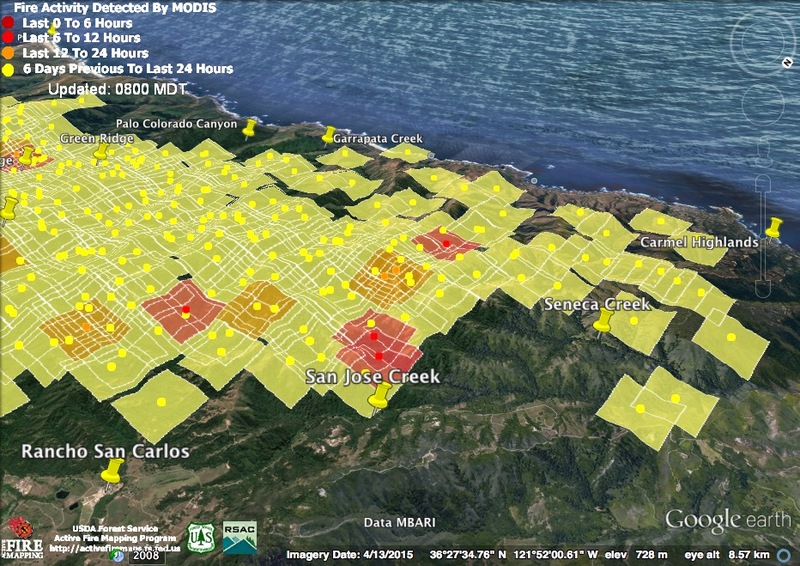 This is particularly encouraging because last night’s heat detections in the Rancho San Carlos area apparently resulted from a burn out operation, which is now said to have been successful. The heat today was concentrated at the south and especially the southeast of the fire. A closer look at the south end of the fire. 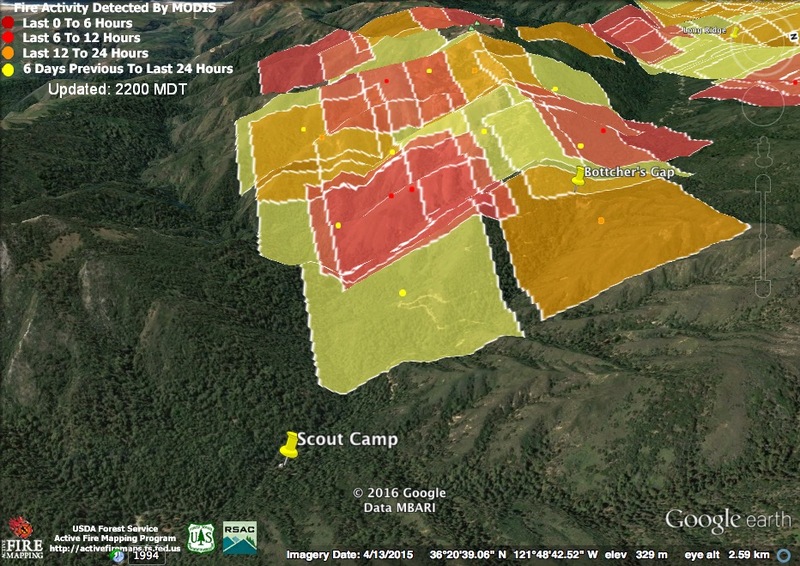 Today’s heat detections suggest that the fire has moved close to and possibly, though not necessarily, into the Scout Camp. 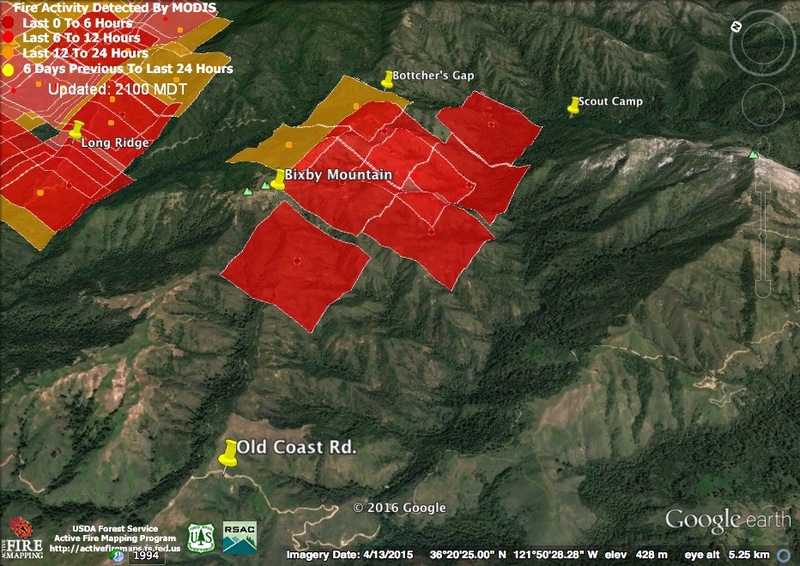 The biggest advance of the day appears to have been across the Skinner Creek drainage and the face of Devil’s Peak. These heat detections are a bit concerning because they are beyond the dozer line intended to prevent the fire from crossing Skinner Ridge. 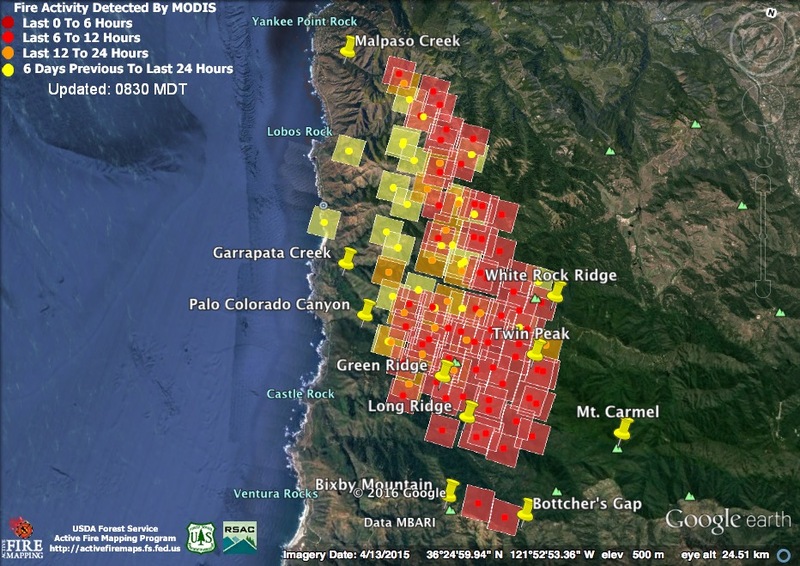 There was also a new heat detection in the headwaters of Pine Creek. 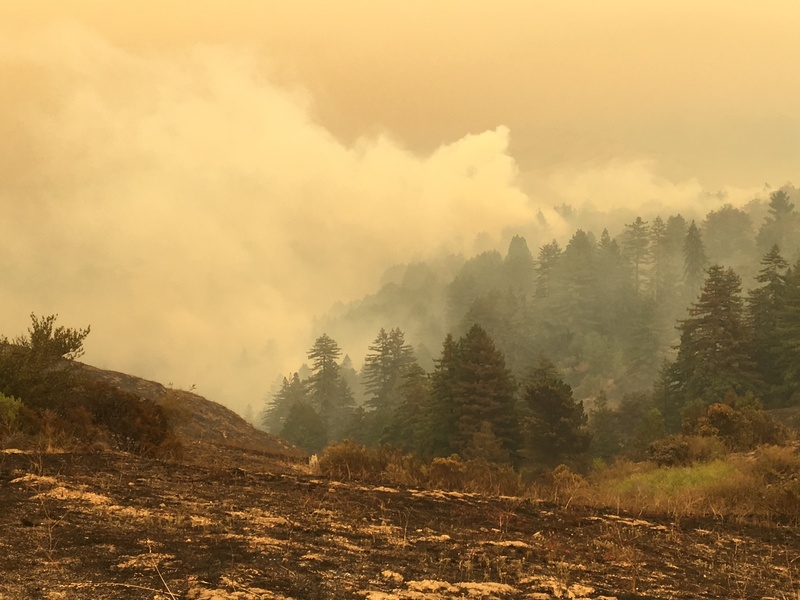 There is still no hard evidence of the fire crossing the North Fork of the Little Sur River and fire officials at tonight’s meeting in Big Sur stated that it had not. 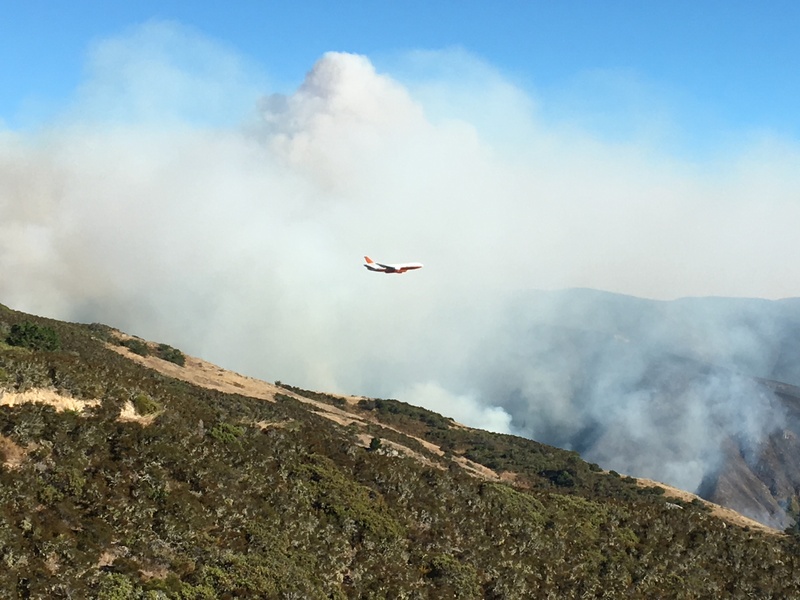 There was considerable new heat on the north side of the stream, though, and planes, including the DC-10 VLAT were painting Dani Ridge this afternoon in anticipation of the fire making it across. 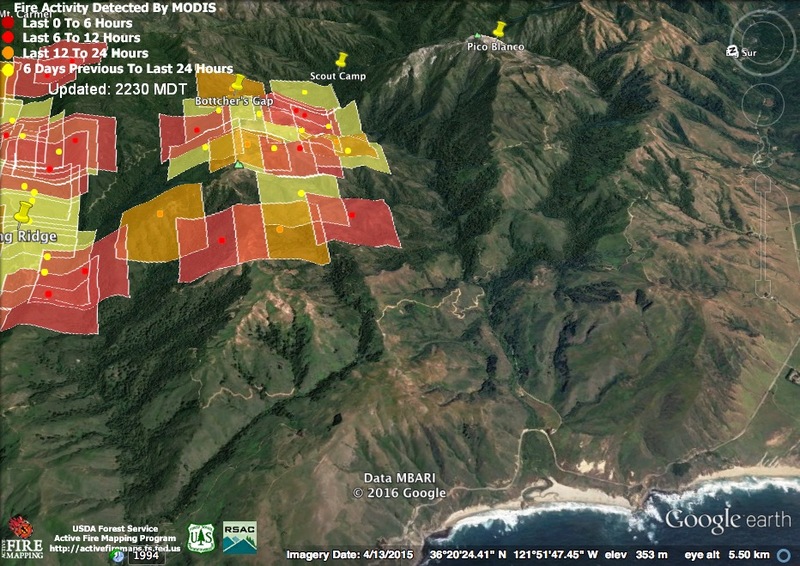 Today’s Operations Map makes clear that the plan is to keep the fire from entering the South Fork Little Sur watershed (and reaching the ridges above the Big Sur Valley) by stopping it on lines running along Dani Ridge, over Pico Blanco, down to the North Fork and up Skinner Ridge. 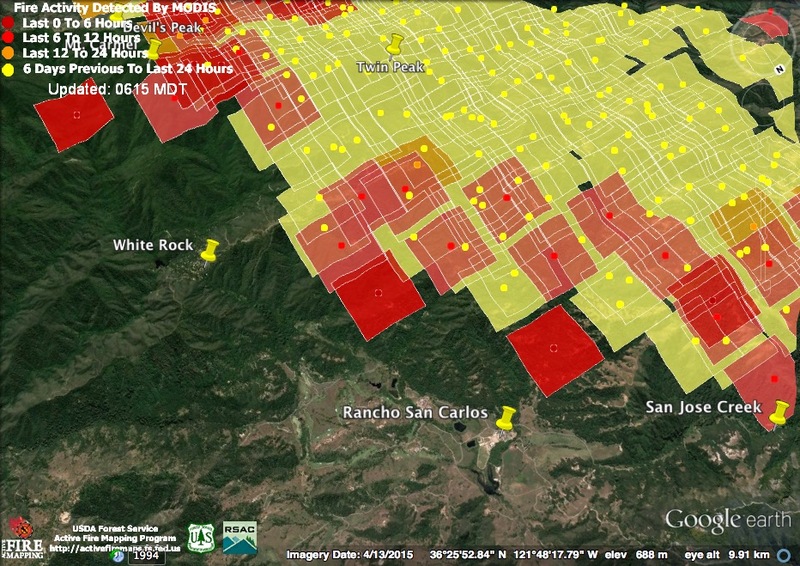 If fire gets established over the line on Skinner Ridge, though, it could well outflank the lines on Dani Ridge and Pico Blanco. Only time will tell. Here’s what the smoke rising from the North Fork Little Sur looked like at 2:30 pm, about the same time that the satellite made its pass and detected heat there. The official numbers: Acres 23,568; Containment 10%; 34 homes and 10 outbuilding lost; 2 homes and 2 outbuildings damaged. Does this mean only 68 additional acres have burned during the past 24 hours? No. The official numbers often lag far behind the facts on the ground and usually do not reflect the advances indicated by heat detections over the past day. In addition, as mapping becomes more accurate, it is often the case that newly burned acreage is “offset” by reductions in the estimate of area previously burned. Overnight thermal imaging. 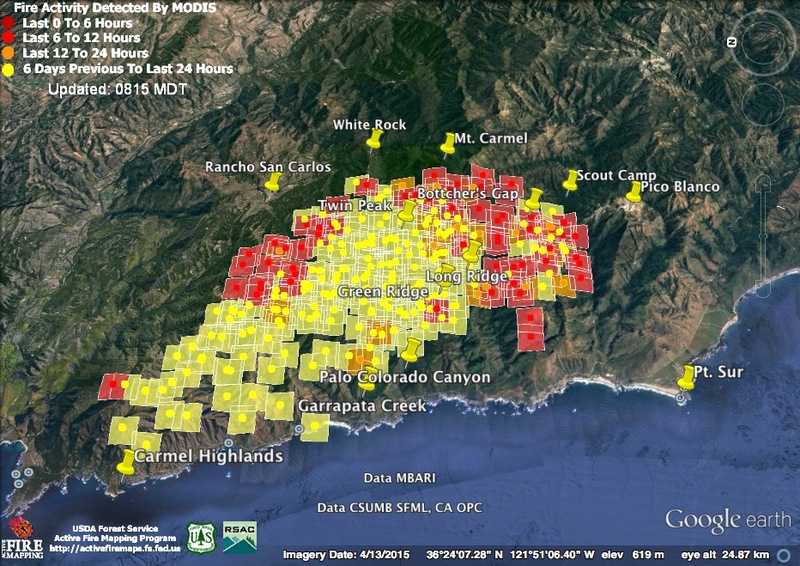 Lighter red squares were detected at around 11:30 pm last night, darker red squares and around 3:30 am this morning. 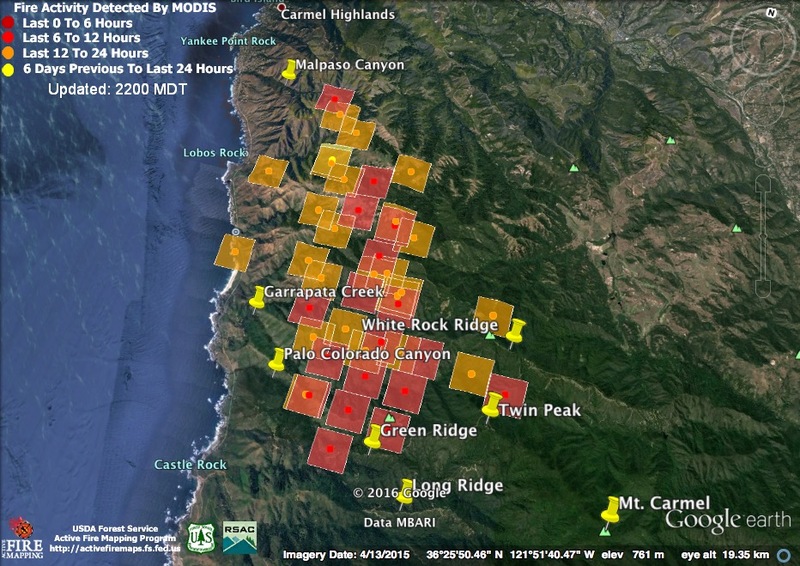 Clearly the most recent (3:30 am) activity has been concentrated on the fire’s east and north sides. Remember that the squares represent the expected margin of error rather than the size of the area on fire and that some detections may be entirely erroneous. 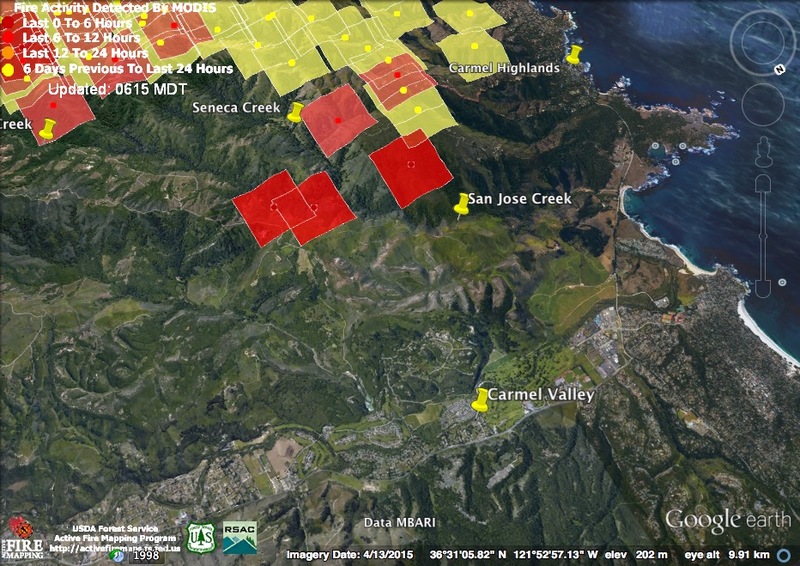 These heat detections suggest the fire behind the Carmel Highlands has advanced north to San Jose Creek – and that it was burning quite briskly there at 3:30 this morning. There were reports that fire had gotten over the line in this area yesterday and was being contained within secondary lines. Hopefully these detections indicate fire still within those secondary lines. The satellite found active fire closer than ever to Rancho San Carlos early this morning, but no indication of fire advancing on White Rock. 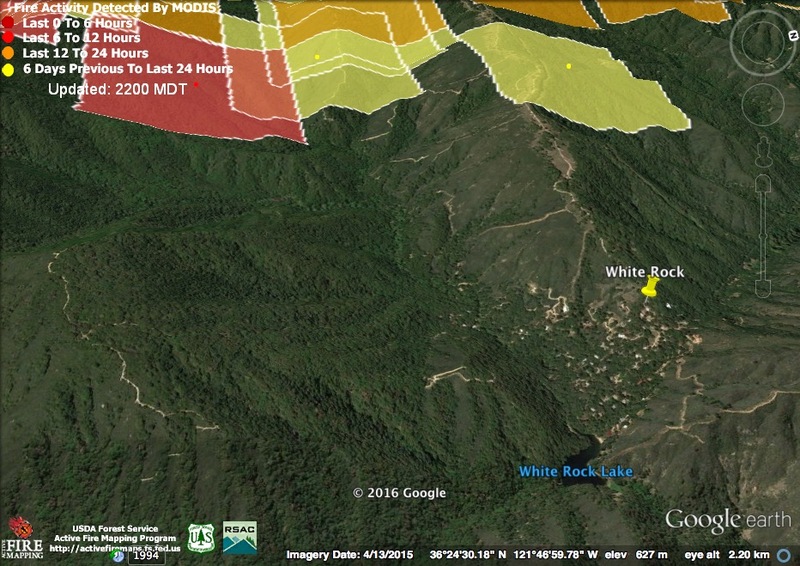 This detection suggests that fire is now burning in the upper Pine Creek watershed. That would be a shame since this area contains one of the last old growth tan oak forests in our area not yet killed by Sudden Oak Death – as well as a scattering of huge ponderosa pines. It also suggests that the White Rock community could soon be threatened from yet another direction. Things looked quieter overnight on the southern end of the fire. 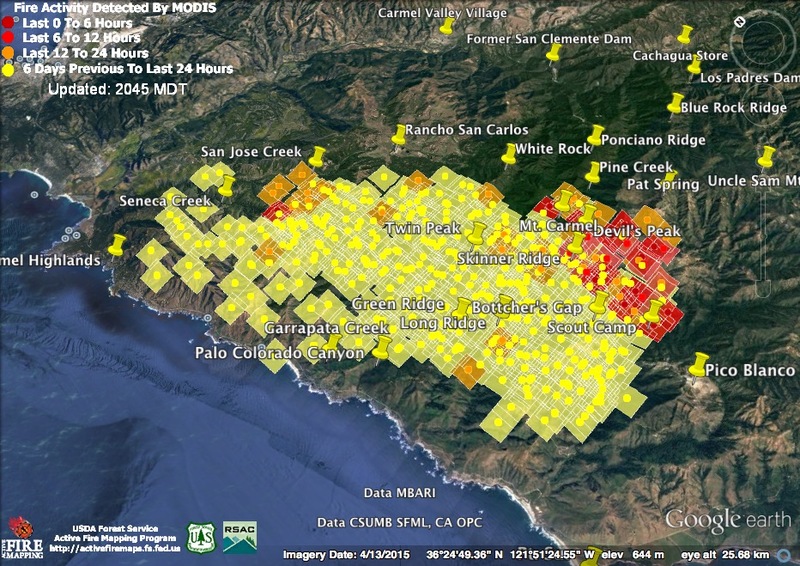 No new heat detections near the Scout Camp or along Skinner Creek, and no sign of the fire making any runs up Dani Ridge or Pico Blanco. 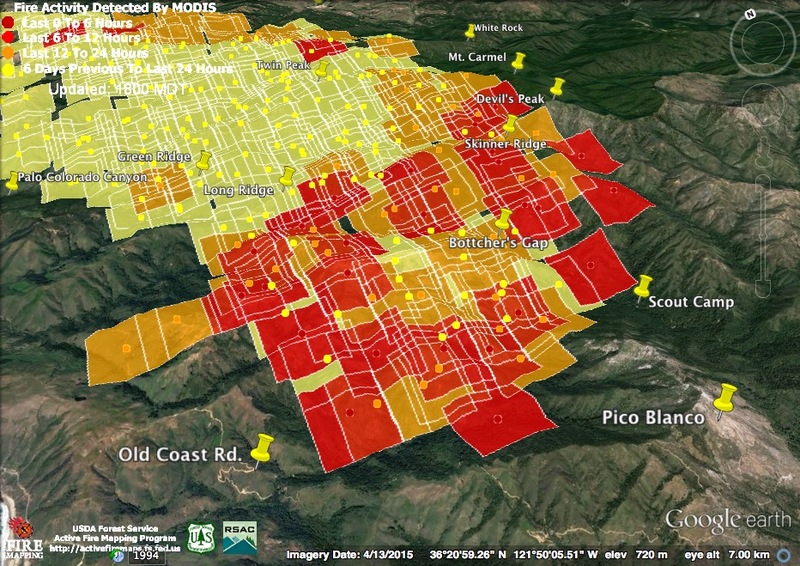 The satellite found heat advancing down Garrapata and Bixby Creeks, as well as in the Palo Colorado, Green Ridge, Long Ridge, and Mescal Ridge areas at 11:30 pm last night, but only in the Long Ridge area by 3:30 am. Remember that lack of heat detections does not mean the fire has gone out; only that it wasn’t burning intensely enough to be noticed at the time the satellite made its pass. Today’s satellite passes, at around 12:30 pm and 2:00 pm, found heat concentrated at the southern end of the fire. The best burning conditions occur in the late afternoon, though, so other areas may well have flared up since. 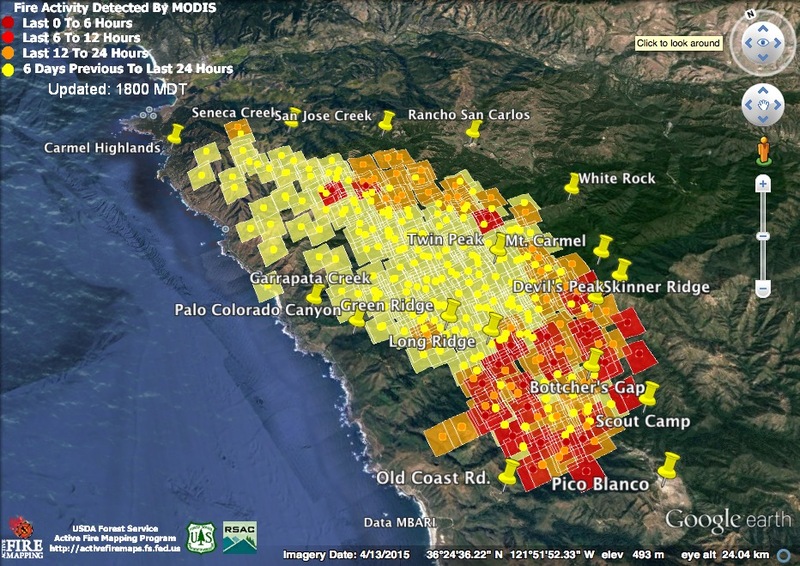 It is still notable that there were no new heat detections at the north end of the fire, above Rancho San Carlos (where mandatory evacuations began this afternoon), or near White Rock – all areas that were burning briskly last night. It’s important to remember that absence of new heat detections does not mean absence of fire. 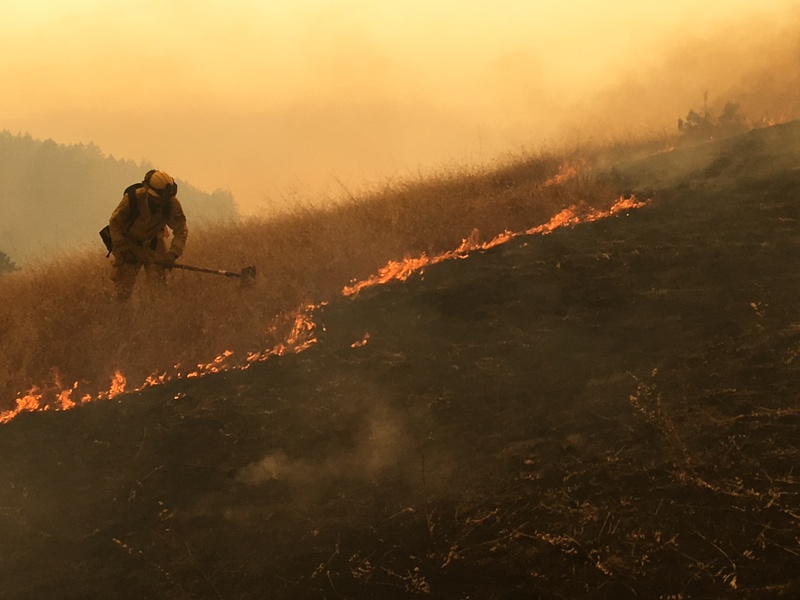 Fire is still backing and making runs in coastal canyons from Mal Paso to the Little Sur River and many homes in those canyons are still at risk. 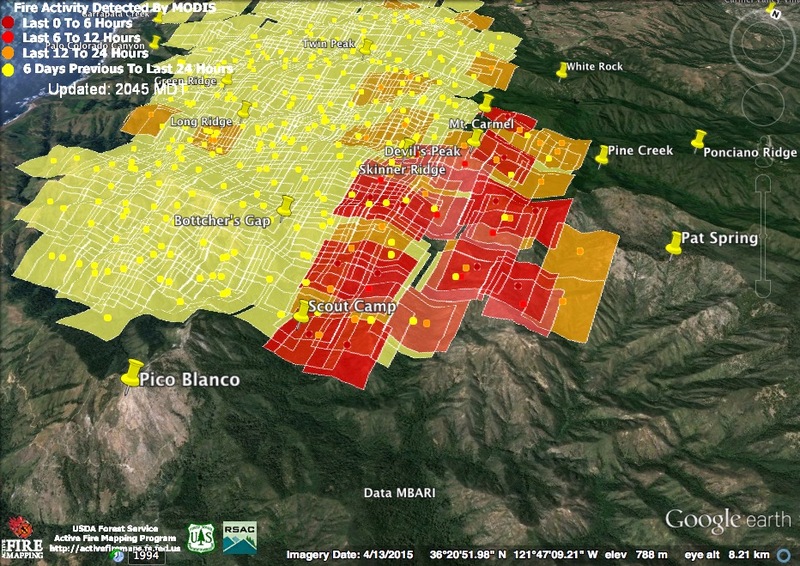 These maps simply give an idea of where the fire was most intense at a given point in time. 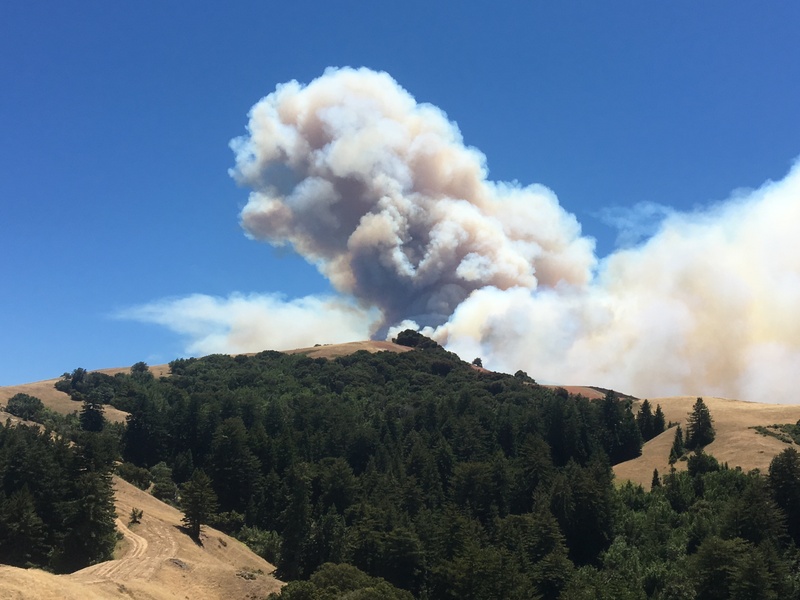 To the south, the fire appears to have continued to actively spread during the day, possibly even crossing the North Fork of the Little Sur River onto the slopes of Pico Blanco and Dani Ridge. 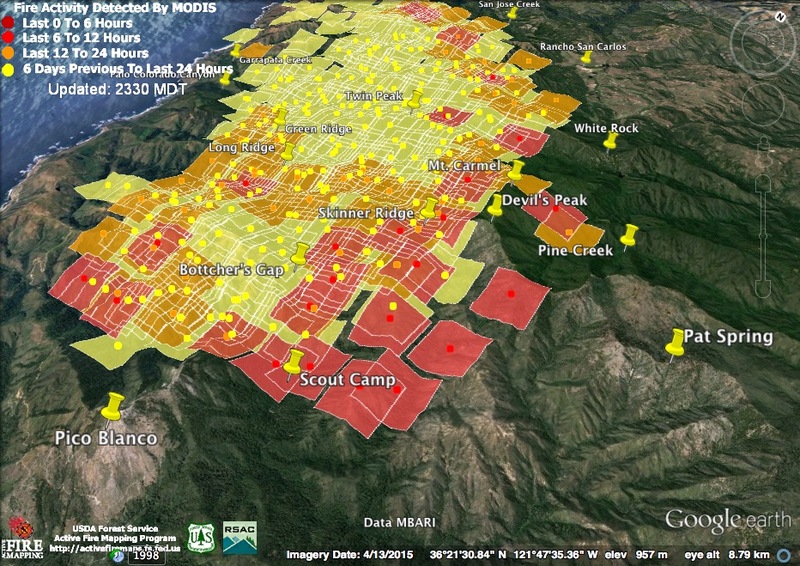 It also appears there may be active fire a little closer to the Scout Camp than before and that the fire is expanding in the Skinner Creek drainage below Devil’s Peak. 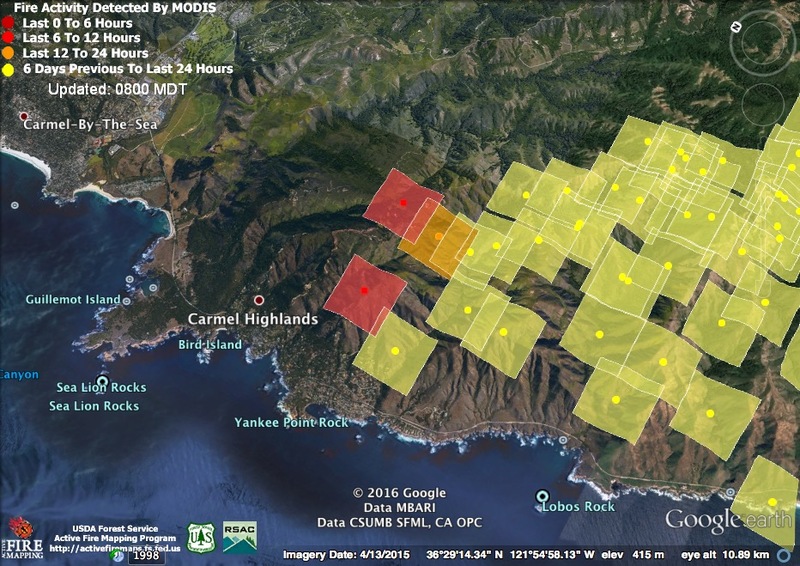 Remember, as always, that the squares represent the expected margin of error (meaning that the square mostly on the south side of the North Fork Little Sur could still have been a detection on the north side of the stream) and that in some cases detections are completely erroneous. The official numbers: 23,500 acres; 10% containment; 20 homes and 2 outbuildings lost. Overnight thermal imaging indicates that the fire was very active when the first satellite pass occurred around 11:00 pm last night, but much less active when the second pass occurred around 3:00 am. In most areas, all the red squares on the map are from the 11:00 pm pass. As always, please remember that the squares are the expected margin of error and do not indicated that everything they cover was burning. Also remember that false detections can occur due to things like heat in smoke columns. 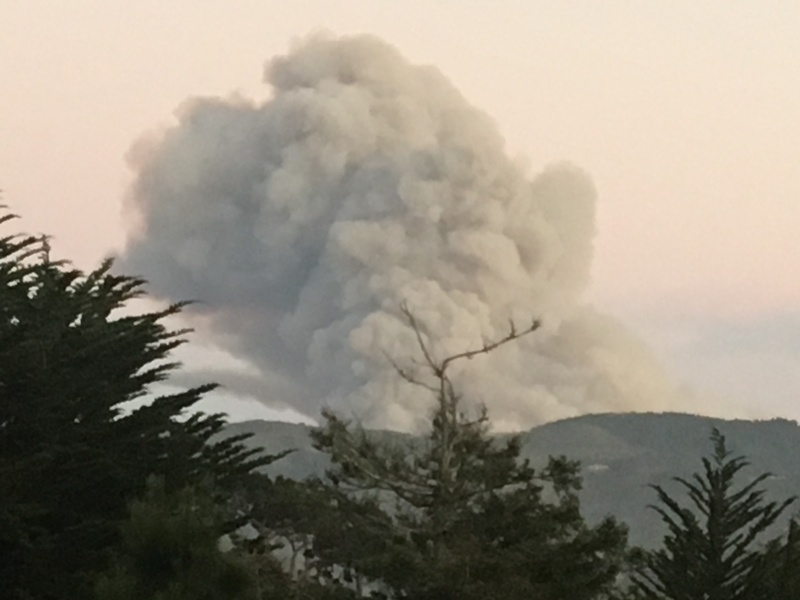 Burning at the north end of the fire was clearly visible from Carmel and Carmel Valley last night. This heat detection, from around 11:00 pm, was probably in the Seneca Creek/San Jose Creek watershed, rather than in the Gibson Creek watershed. Lines were being bulldozed around the fire in that area yesterday and there is no indication at this time that the fire has gotten over those lines. This expansion of the fire in the area of the Mitteldorf Preserve, was detected by the 3:00 am satellite pass. There was also active fire above White Rock at 3:00 am. 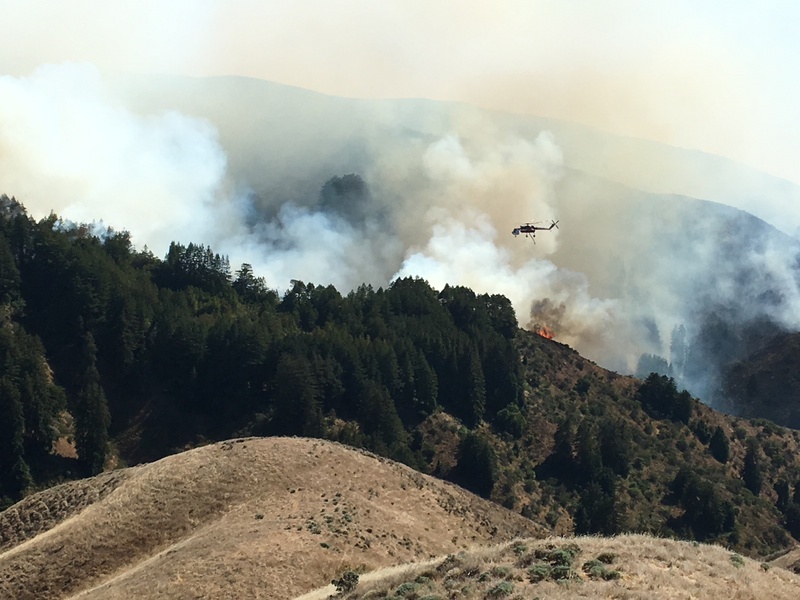 The 11:00 pm pass found active fire on Skinner Ridge and across Turner Creek toward Mt. Carmel. While there is no sign of the fire advancing toward the Scout Camp, the 11:00pm pass found lots of heat further downstream. 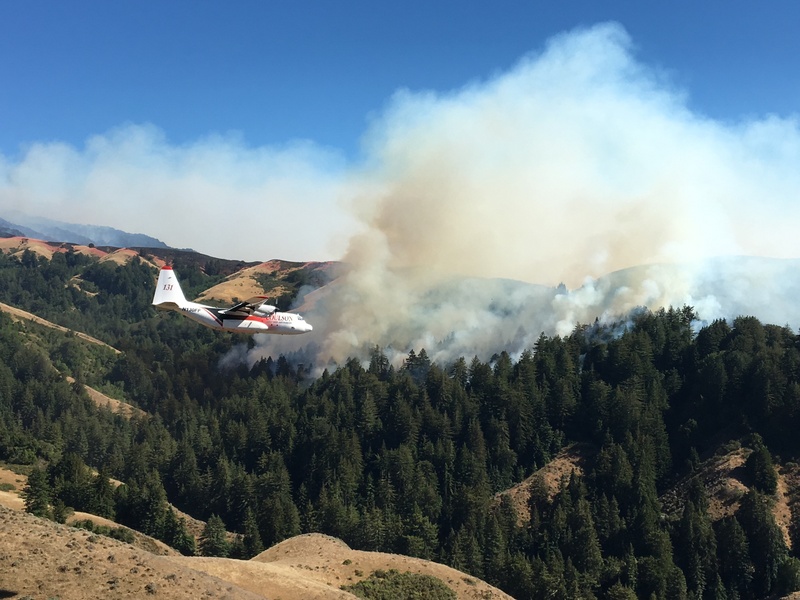 There is no indication that the fire has crossed the North Fork of the Little Sur River – yet. The 11:00 pm pass also detected fire in the vicinity of the Chapman/Moon property near the Old Coast Rd. No heat was detected here on the 3:00 am pass. The official numbers: 19,311 acres; 10% containment; 20 homes and 2 outbuildings lost. 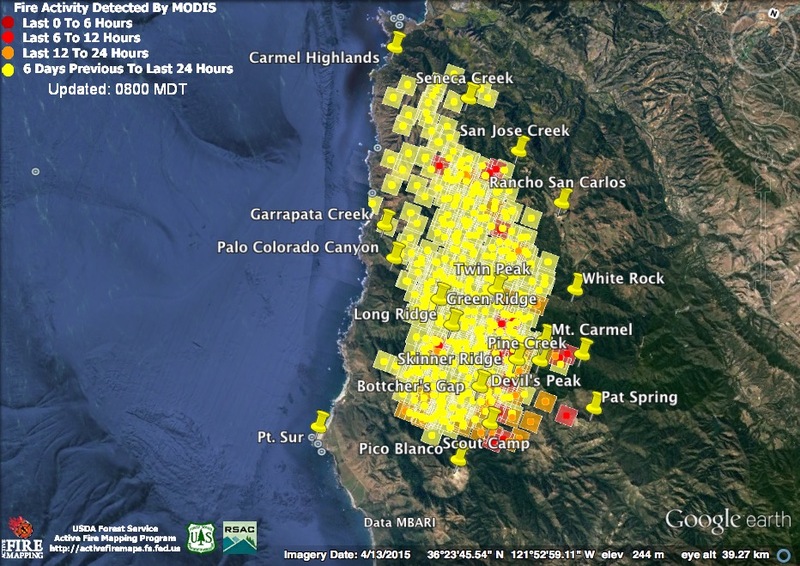 Click here to view this morning’s official fire maps. 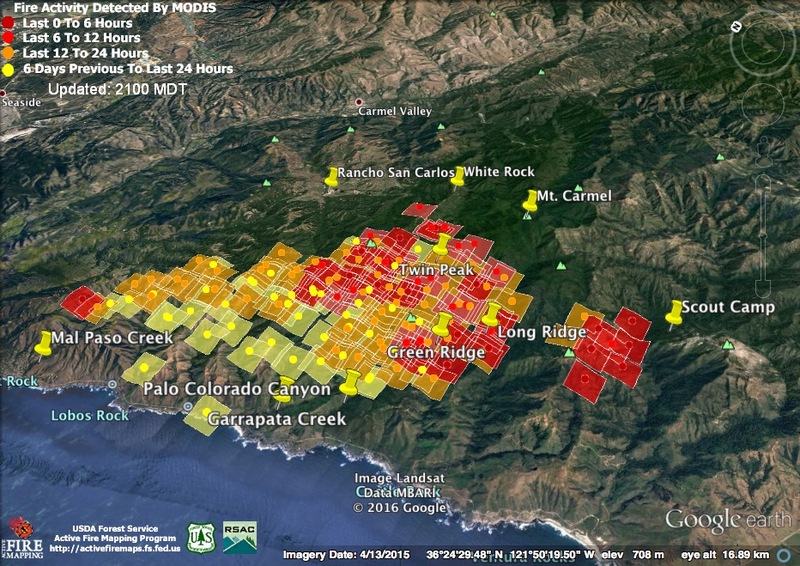 As the above heat detection maps make clear, the fire has moved beyond the positions shown on the official maps in many places. These maps are mainly useful because of the information they provide on where dozer and hand lines are being constructed. Most of the red squares on this map were detected around 2:00 pm this afternoon. Remember that the squares represent the expected margin of error and that false detections can occur. Just because no heat was detected in a particular area does not mean the fire is out there. 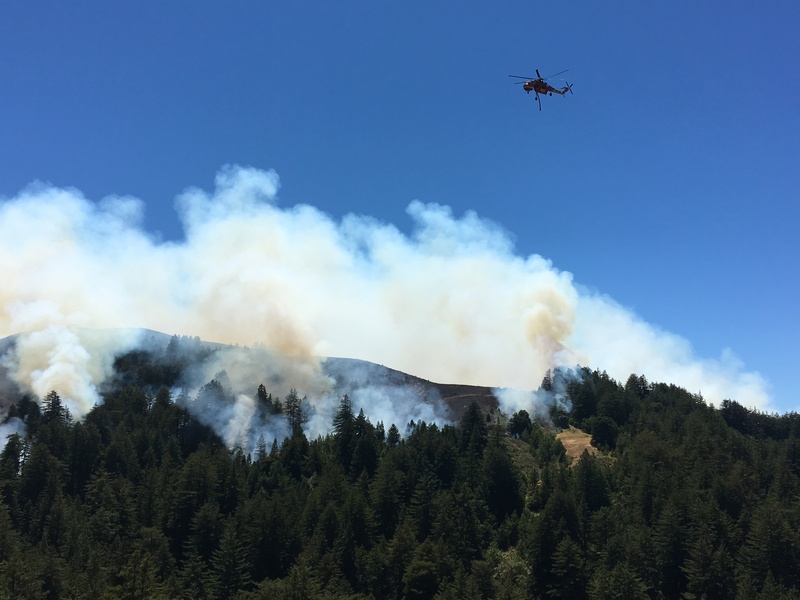 The fire continues to burn at its north end near the Carmel Highlands, for instance (see photos below), it just wasn’t burning intensely enough at 2:00 pm for the satellite to notice it. 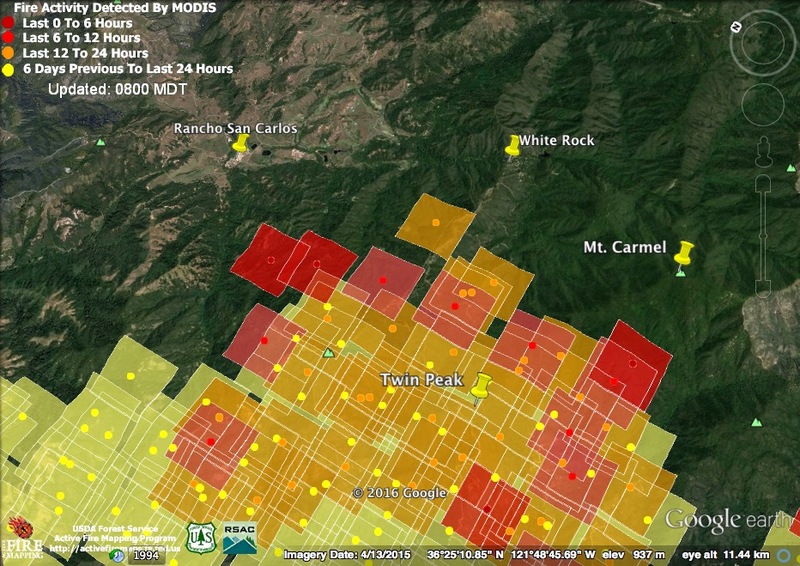 This new detection above Rancho San Carlos was confirmed by a fire official at tonight’s public meeting in Carmel. He stated that fire had slopped over the line in this area and that significant resources had been assigned to combat it. The thermal imaging suggests that, while the fire continues to menace White Rock, it has not made much progress toward it in the past 24 hours. 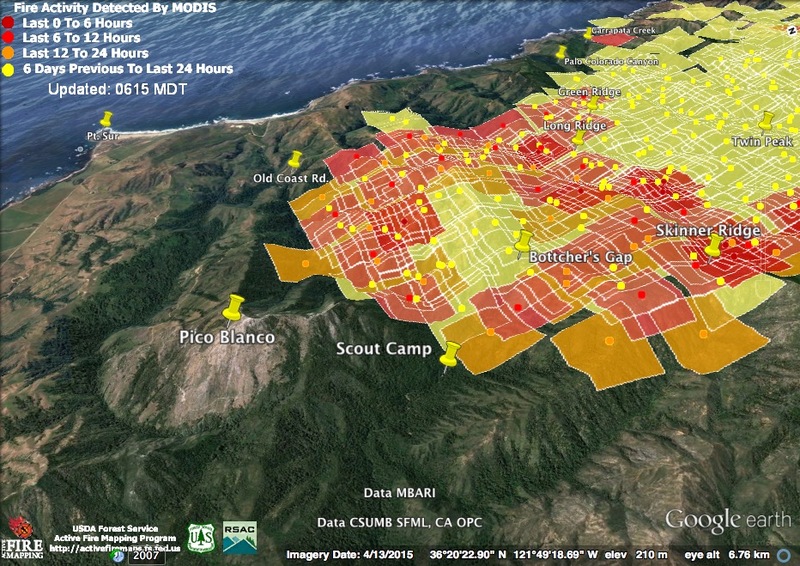 Similarly, the satellite found no sign of the fire having moved closer to the Pico Blanco Boy Scout Camp. Fire officials stated at tonight’s meeting that they did not believe the fire had advanced in this area today. 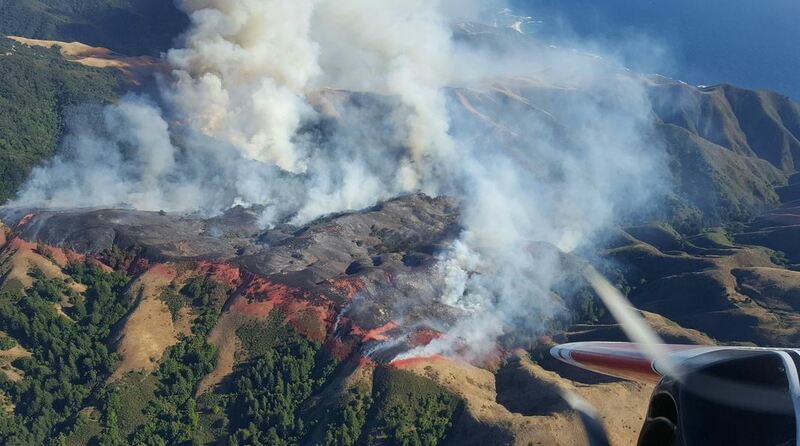 This isn’t surprising considering that this fire was moving downslope, against the wind, and into the marine layer. Further west, and higher, along Mescal Ridge it was much hotter. There have been reports all day, and even this evening, of large runs and flare-ups in this area. 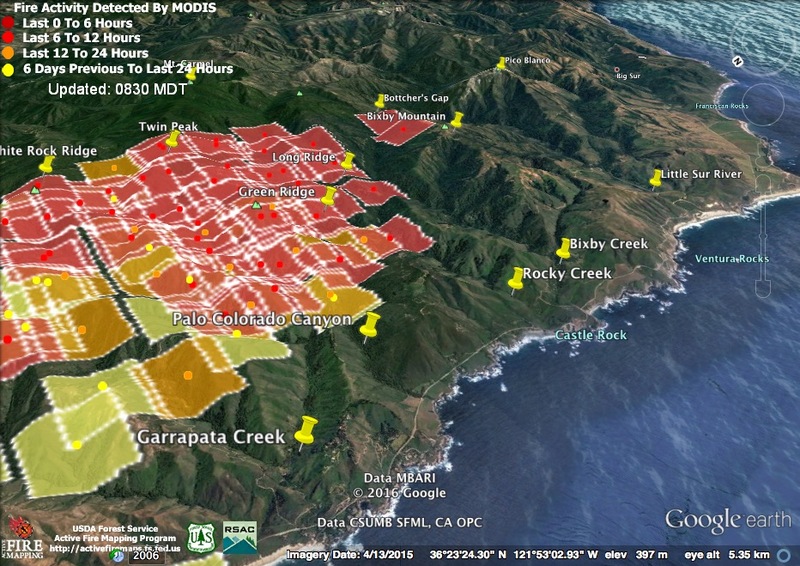 In spite of the fog, the satellite found fire actively burning in the lower Garrapata Creek watershed. This is confirmed by local residents. The latest official numbers: 16,100 acres; 10% containment; 20 homes plus 2 outbuildings lost. Overnight thermal imaging. Lighter red squares were detected at around 11:30 last night. 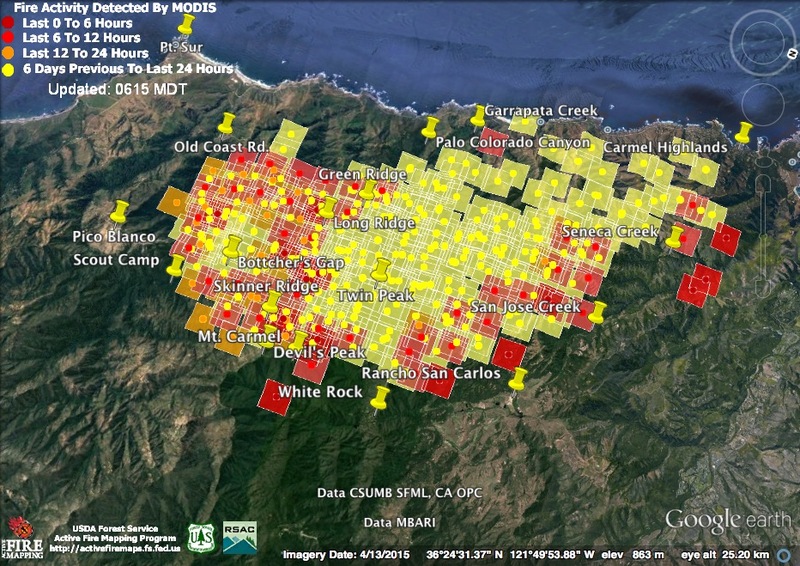 Darker red squares were detected at about 4:00 am this morning. Please remember that false readings can occur and that the squares represent the expected margin of error rather than the size of the heat signature. 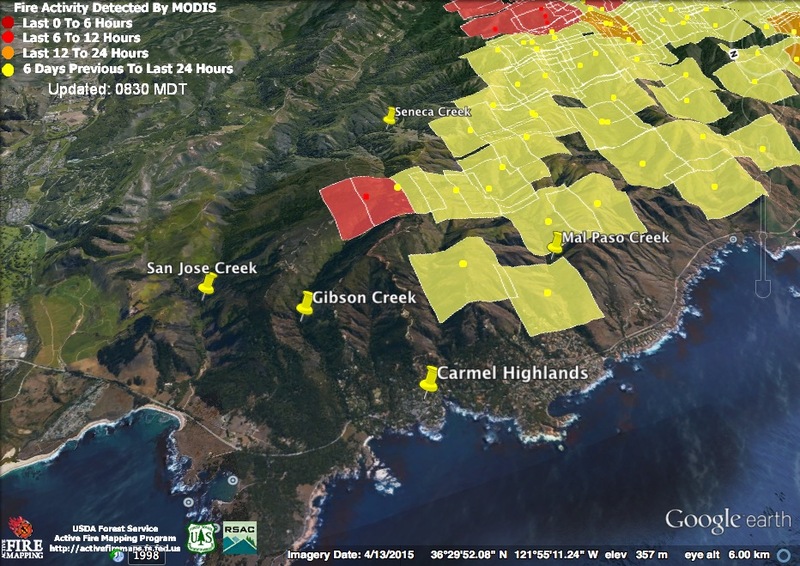 The bad news is that at 11:30 pm the satellites found the north end of the fire still expanding above the Carmel Highlands. The good news is that at 4:00 am the satellites failed to detect heat there. That doesn’t mean the fire is out or no longer a threat, but it is an indication that it was burning much less intensely than it had been at 11:30. The satellites often fail to detect fire that is burning at a slow rate. Fire is smoldering and creeping in many canyons along the coast right now, for example, but there are no heat detections in those locations. More good news is that the satellites failed to find any indication of fire actively advancing toward the cabins at White Rock overnight. 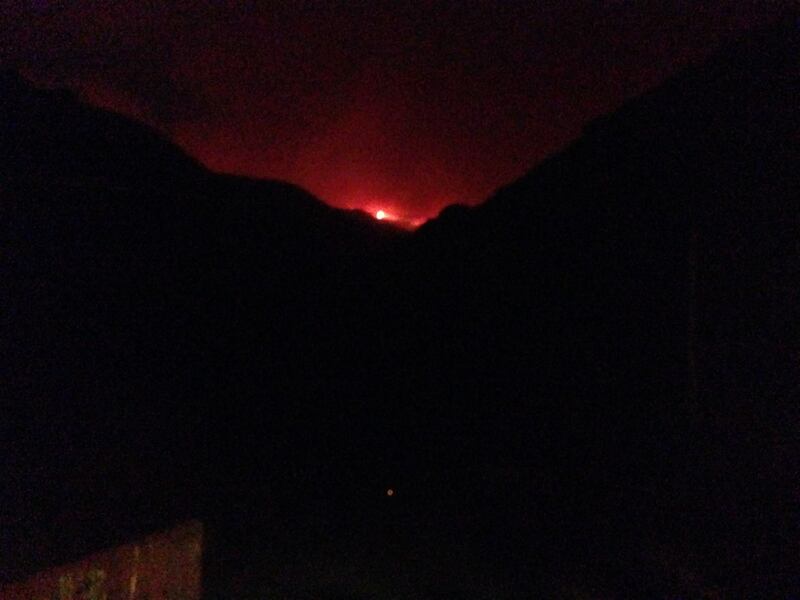 The 4:00 am pass did find fire burning toward Mt. 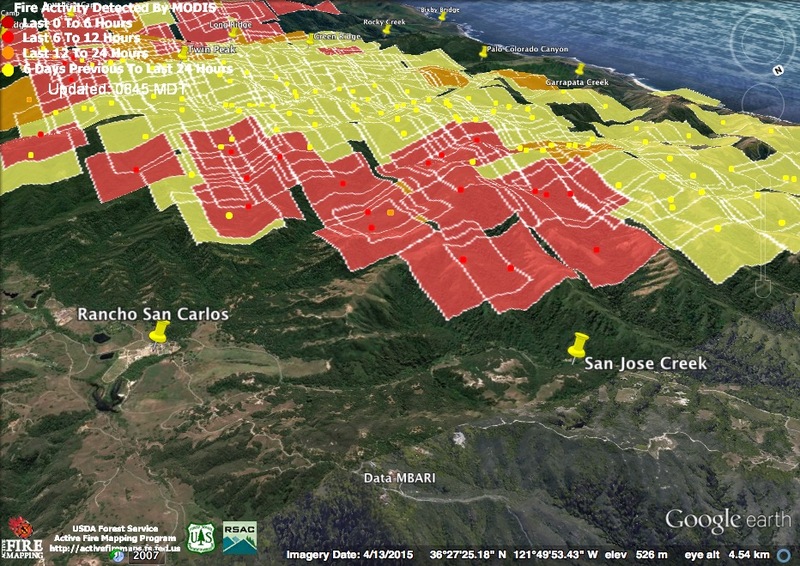 Carmel and in the hills above Rancho San Carlos, and these flame fronts have likely continued to advance. 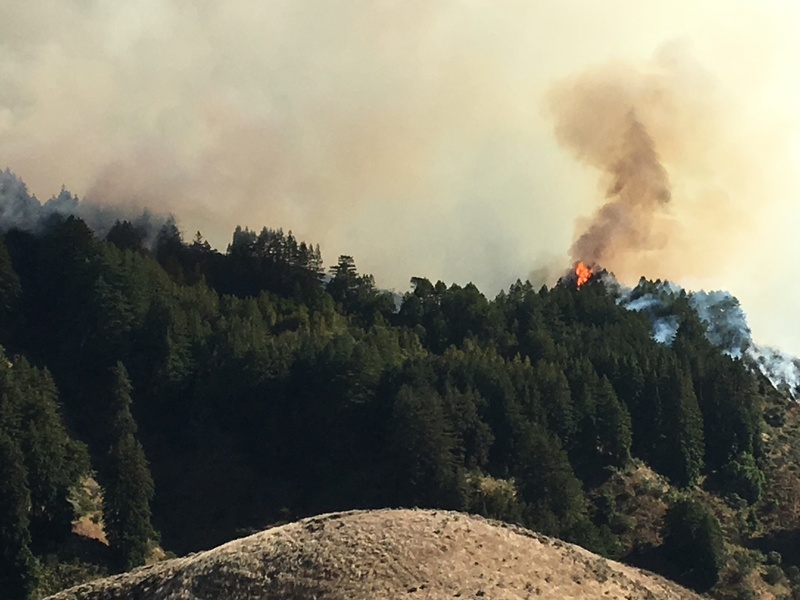 The satellites failed to find new heat on the flame front advancing toward the North Fork of the Little Sur River and threatening the scout camp. This is unsurprising considering the thick marine layer pushing up the Little Sur Canyon. Back in the high country, though, the still expanding “spot fire” was climbing Skinner Ridge. 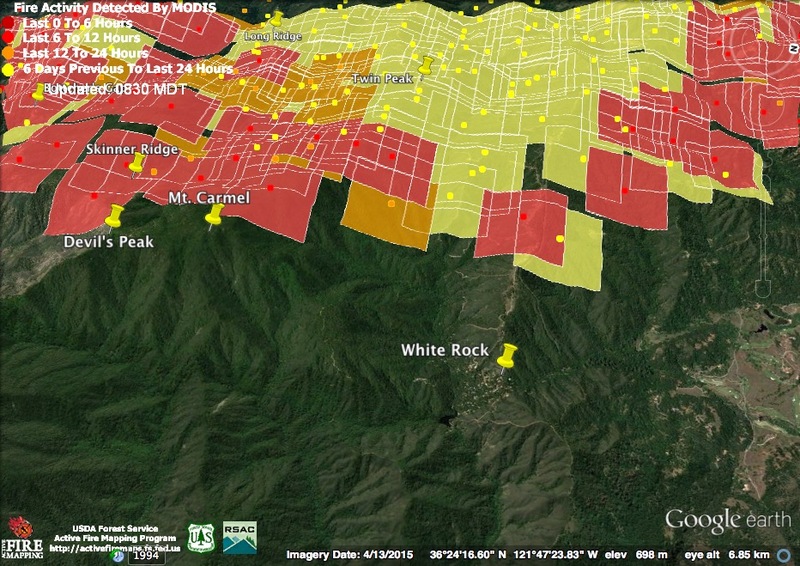 Heat was also detected between the spot and the main fire on Long Ridge indicating the two may soon (assuming it hasn’t already happened) burn together. Cal Fire says the fire has reached 14,897 acres this morning. That does not mean that it burned nearly 4,000 acres overnight, just that better mapping has picked up more of what burned yesterday. They still list containment at 5%. They have now confirmed 20 homes and 2 other structures destroyed. Thermal imaging map showing new detections from around 1:30 and 3:00 this afternoon. As always, please remember that false readings can occur and that the squares represent the expected margin of error, rather than the area burned. It’s easy to see from the map how today’s unexpectedly deep marine layer kept things cooler close to the coast, but had little impact on the fire at higher elevations and further east. At around 6:00 this evening I was told by firefighters on the scene that this detection, on the north side of Mal Paso Creek, is not an error, but is a spot fire that was, at that time, thought to be around 200 acres. It was being heavily attacked with aircraft (which I could hear overhead, but not see, due to thick fog). 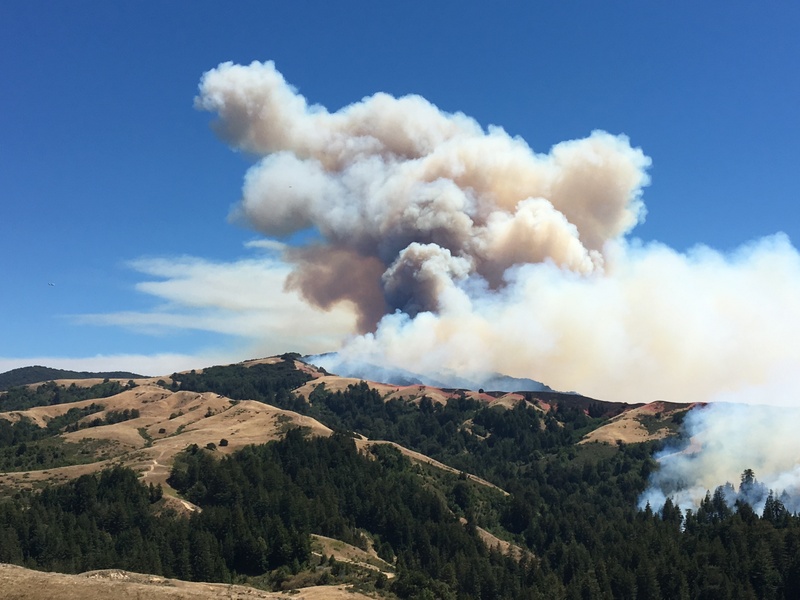 The spot fire burning into the Little Sur River watershed also appears to be expanding rapidly, although the satellite found no sign of it having merged yet with the main fire. This fire’s rapid growth is, no doubt, what prompted the evacuation of the Bixby/Old Coast Rd. area this afternoon. 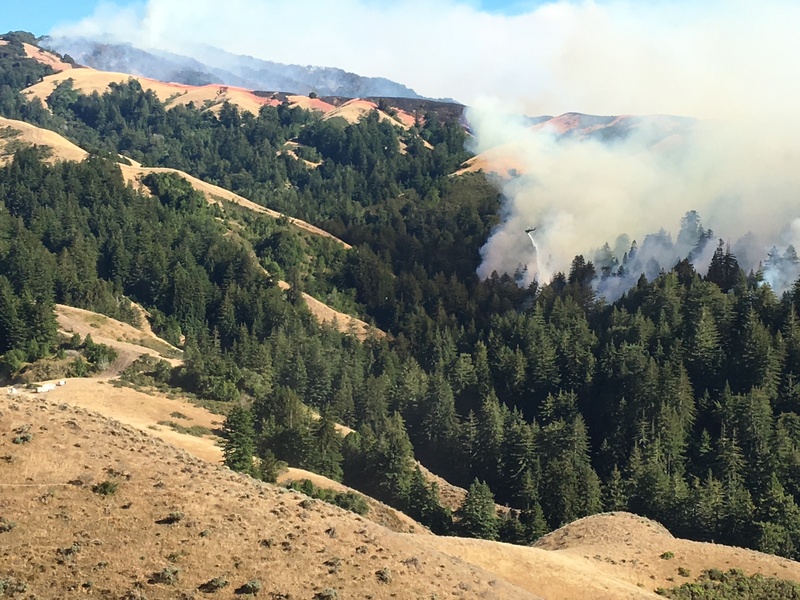 The main fire also remained very hot today, expanding further into the Long Ridge area and eastward along White Rock Ridge toward the many cabins at the White Rock Club. There were rumors today about the White Rock Club being “lost,” but , as of 3:00 pm anyway, the satellites failed to find heat there. An onshore wind blows smoke across Rancho San Carlos. Aircraft had difficulty operating in some areas due to heavy fog and smoke. Fire smoldering under the fog in lower Mal Paso Canyon. Cal Fire has upped the official acreage to 11,000, kept the containment listed as 5% and is reporting 6 homes and 2 outbuildings lost. That number will, unfortunately, rise as more areas are surveyed. Thermal imaging indicates the fire was very active overnight; continuing its march to the south. The red spots indicate where heat was detected during satellite passes at around 11:00 pm last night and 3:00 am this morning. As always, please remember that false readings do occur and that the red square is the expected margin of error. A spot fire, which broke out ahead of the main fire near Bixby Mountain, was picked up quite strongly on the 3:00 am pass. Here’s a closer look at the southern end of the fire. 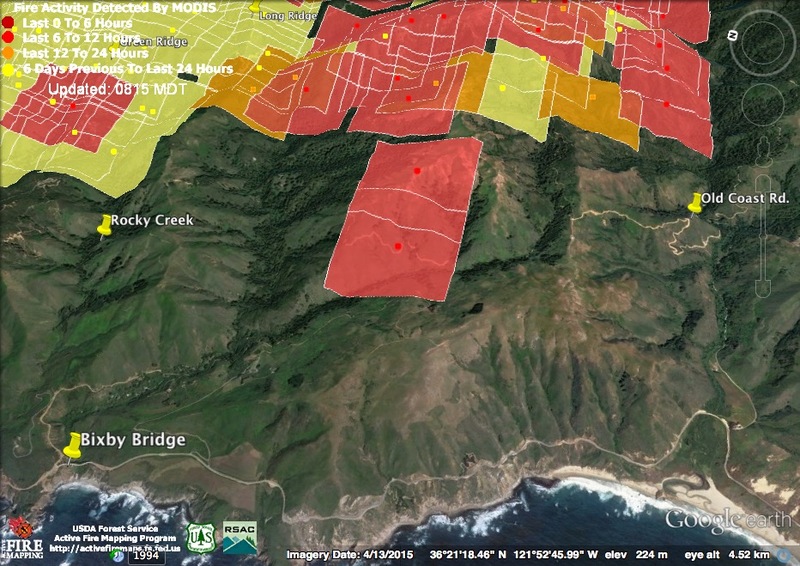 These heat detections suggest that the main fire front had made it as far as Long Ridge by 3:00 am. 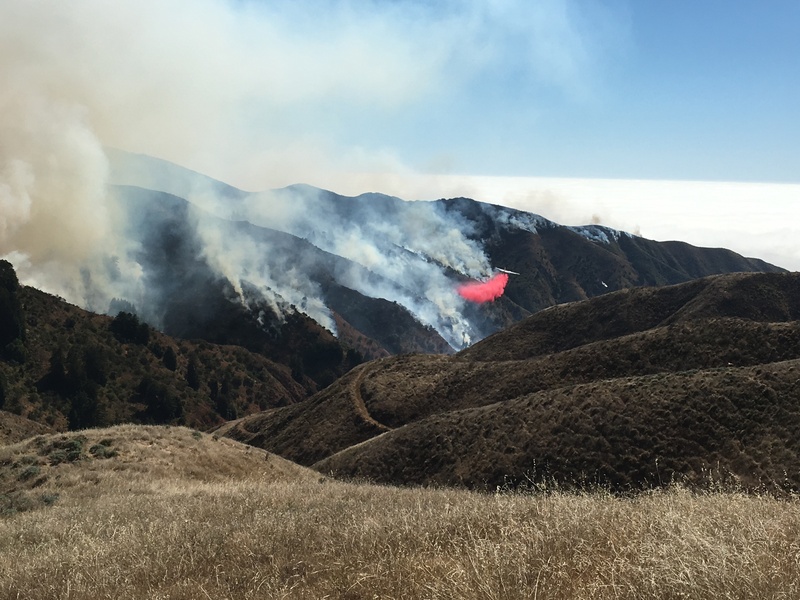 At the northern end of the fire, a burn out operation in the headwaters of Mal Paso Creek (high on Palo Corona) produced flames that were visible from Carmel Valley and even Santa Cruz last night. 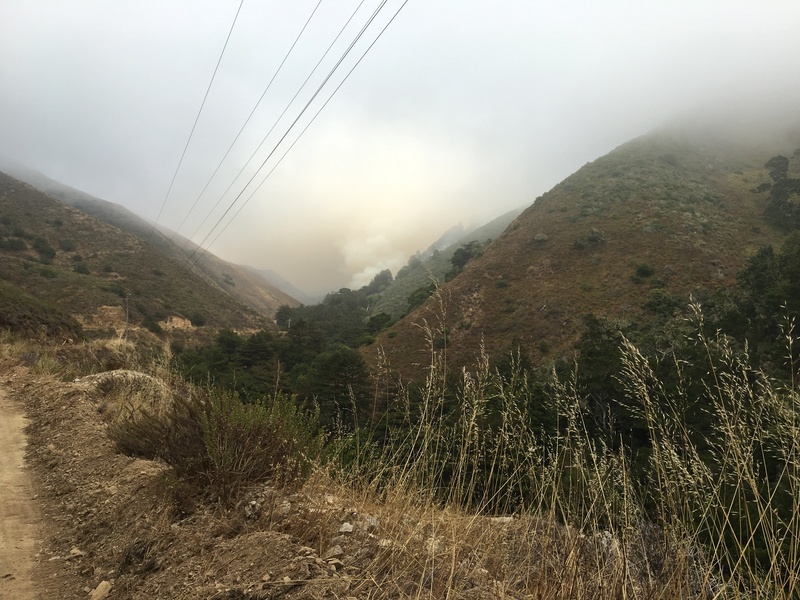 This operation, which appeared at a distance to be successful, was intended to prevent the fire in Mal Paso Canyon from crossing into the San Jose Creek watershed. The satellites did not detect heat further down Mal Paso Canyon. Fire had been burning closer to the coast during the day, so that is a sign that fire activity, as usual, was minimal during the night at lower elevations. Cal Fire is reporting the fire as 10,262 acres and 5% contained this morning. Here is what the thermal imaging satellites were seeing as of about 1:00 pm this afternoon. 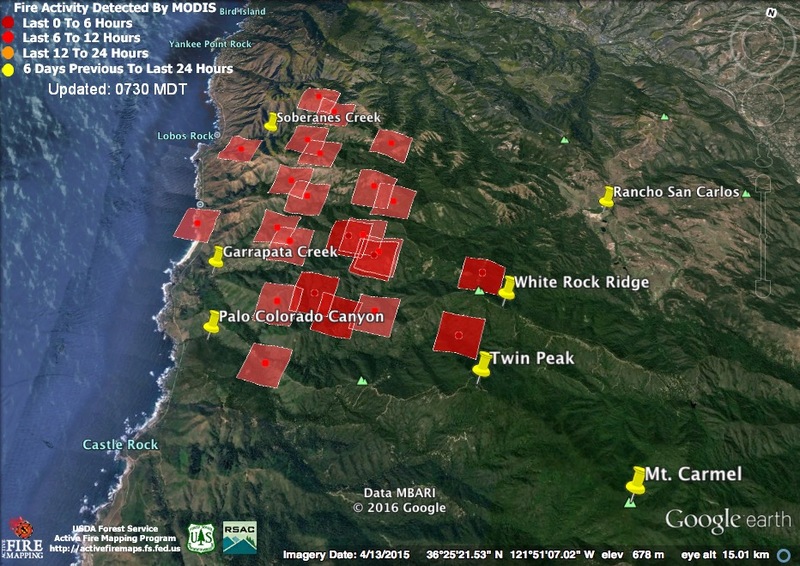 They indicate continued movement of the fire south into the Palo Colorado area and east just north of Twin Peak. They also pick up the north end of the fire backing into Mal Paso Canyon. Please remember that the squares indicate the expected margin of error and that some squares may be entirely erroneous. 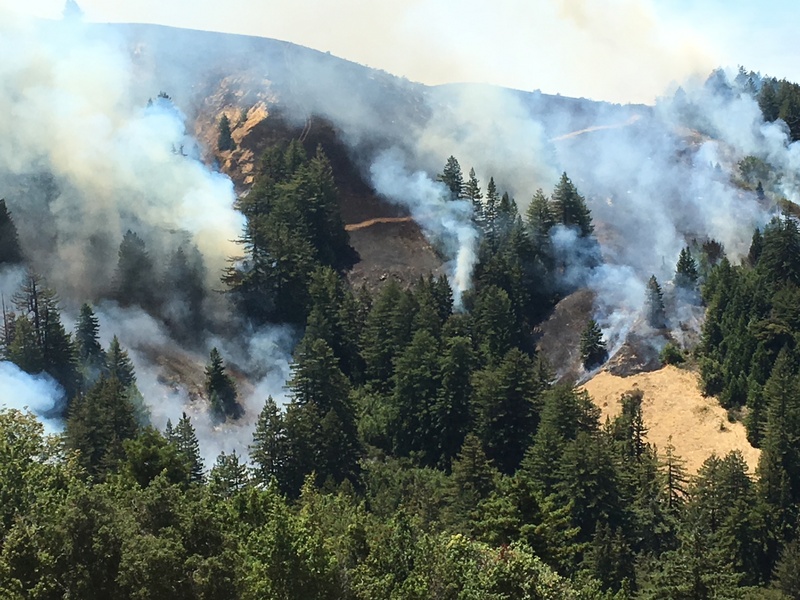 1:00 pm: Fire backing into the redwood forests in the upper Mal Paso Creek watershed. 1:10 pm: Helicopter working to slow the fire’s advance toward Mal Paso Creek. 1:30 pm: Somewhere south of Palo Corona things are heating up. 1:35 pm: View down the Mal Paso Creek watershed from the slopes of Palo Corona. 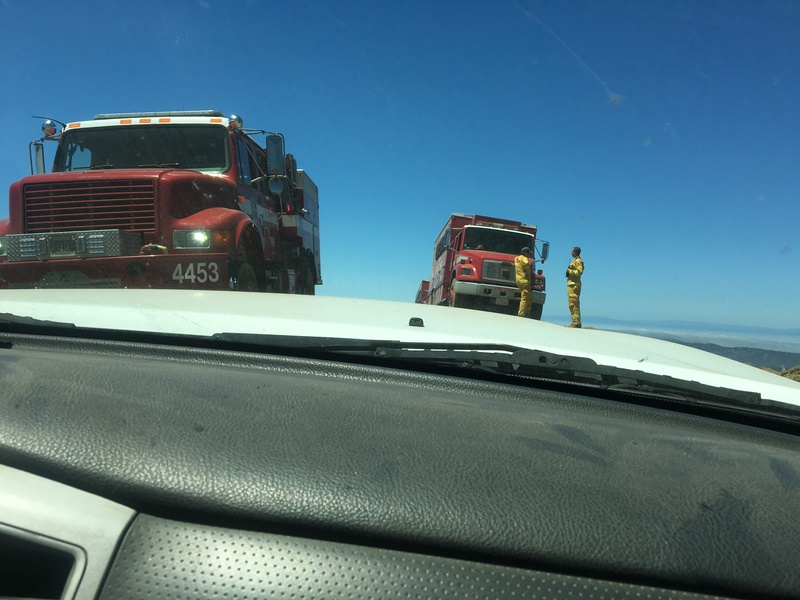 2:00 pm: Palo Corona; fighting fire at the top of the world. 2:06 pm: Backing fire; Mal Paso watershed. 2:12 pm: Chopper knocking down hot spots. 2:30 pm: Another run somewhere to the south. 4:15 pm: The fight in Mal Paso Canyon continues. 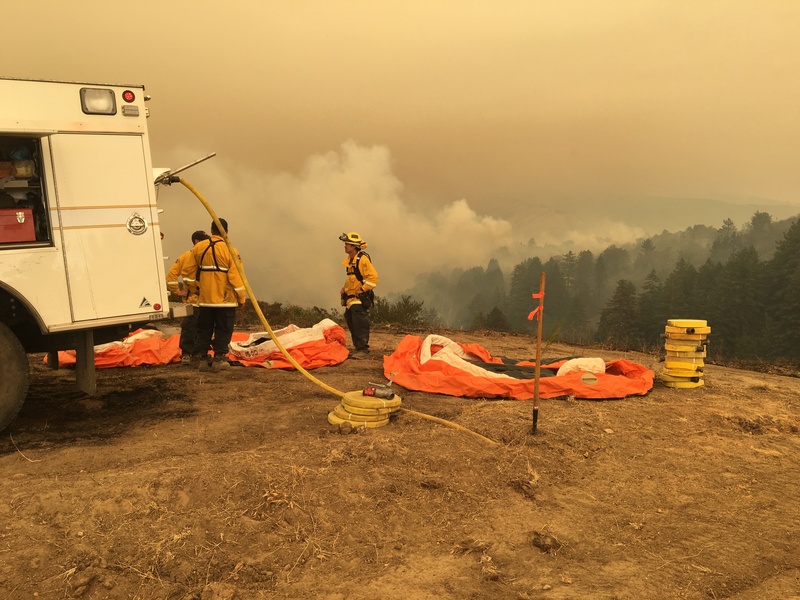 4:30 pm: The fixed wings arrive on the north end of the fire. Painting the bottom of Mal Paso Canyon. 5:30 pm: Choppers still dropping. 5:40 pm: At tree erupts in flame as the fire advances. 6:00 pm: The DC-10 “Very Large Air Tanker,” or VLAT, over Mal Paso Canyon. 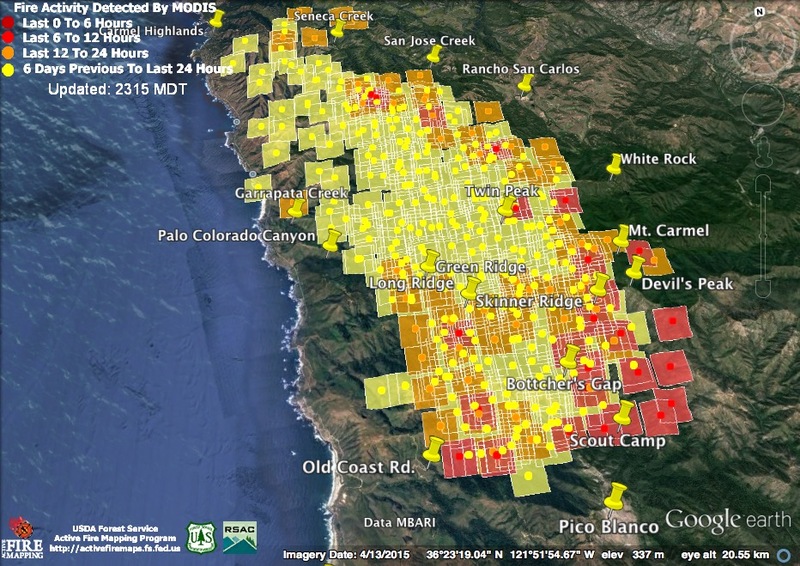 Overnight thermal imaging tells the story of how the Soberanes Fire rapidly expanded last night. The squares represent the margin of error, meaning that heat was detected somewhere in the square, not necessarily in all of it. It isn’t 100% accurate. Sometimes heat in the smoke causes a false detection outside the actual fire area, so it should only be taken as a general guide to what the fire was doing at the time of the satellite pass. 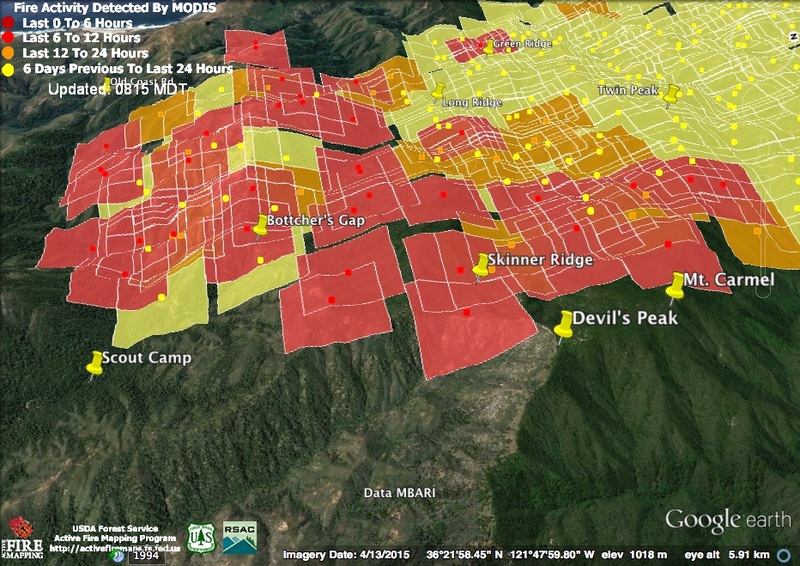 The lighter red squares are where fire was detected at around 11:15 last night as the fire was making its big run. The darker squares were detected at about 2:50 this morning. This shows that, in general, things had cooled down by then, but that the fire was still very active on the higher ridges. 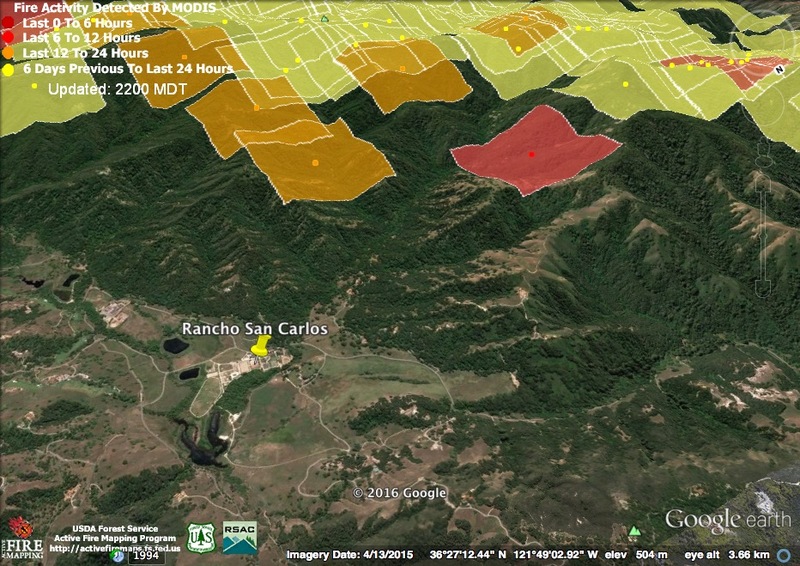 One heat detection, from 10:15 last night falls on Garrapatos Ridge, between Garrapata and Palo Colorado. There’s no information as yet this morning on whether or not that’s accurate, or on how far into the Palo Colorado area the fire may have burned after these detections were made. 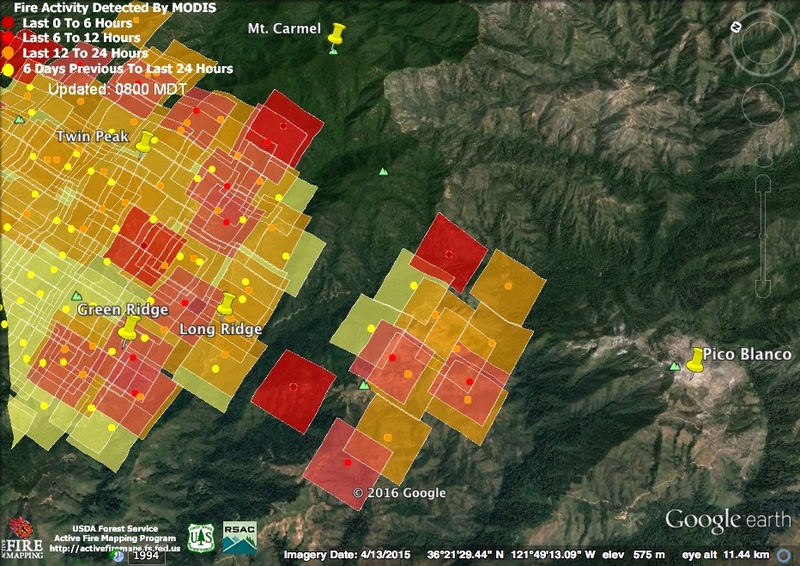 The lack of detections in the Palo Colorado area on the later pass suggests, though, that the fire in that area calmed down some after midnight. Midnight Update: Cal Fire says the fire is now 2,000 acres. 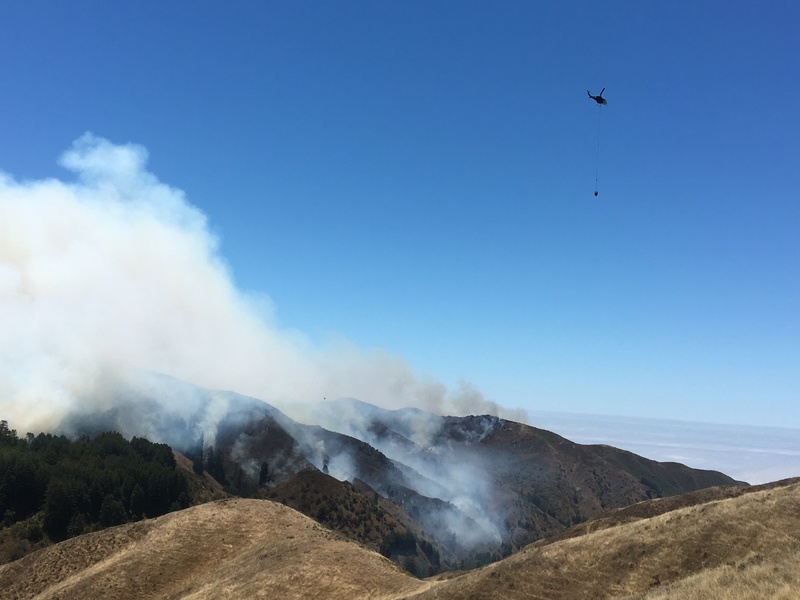 Hikers on the extremely popular Soberanes Loop Trail in Garrapata State Park spotted the Soberanes Fire smoldering in a forested draw further up the canyon sometime around 8:00 or 9:00 this morning. 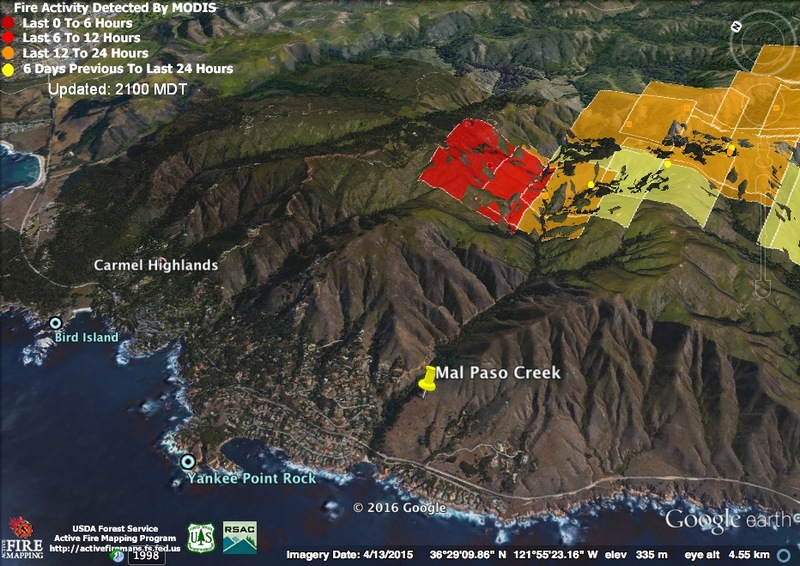 The fire spent most of the day burning in the upper Soberanes Creek watershed, reaching (and being stopped at) the ridge, as clearly seen in this photo, between Soberanes and Mal Paso Canyons, and burning along the lower slopes of Palo Corona (left and upper left of the photo). It did not reach any part of the popular trail. 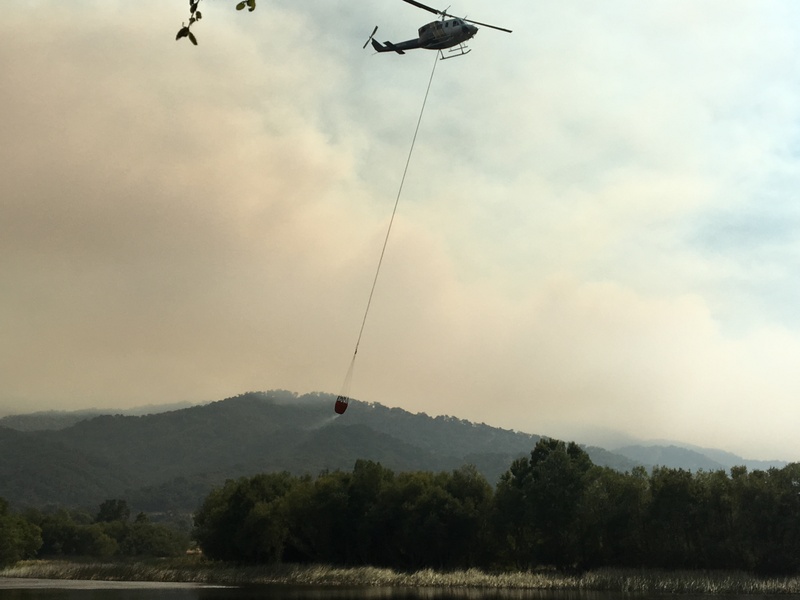 By early evening, the fire had burned around 300 acres. 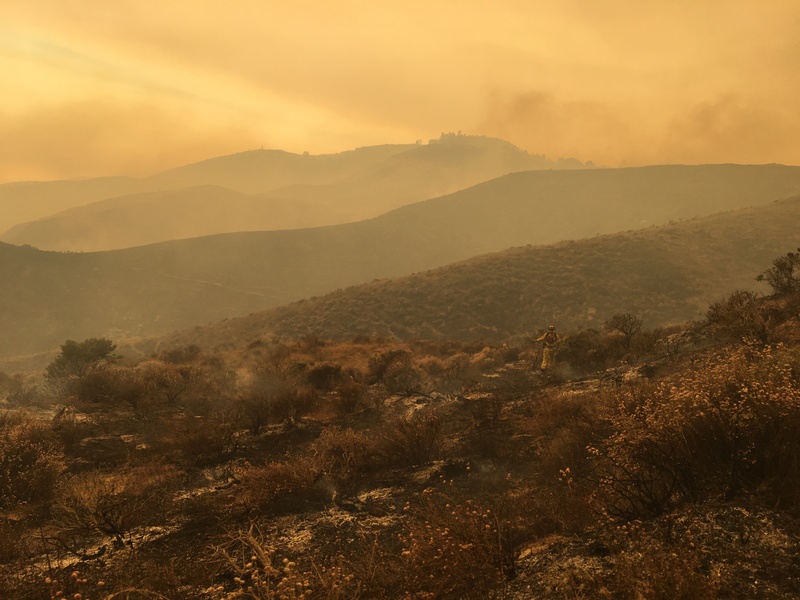 Sometime after 6:00 pm the fire began a major run up the slopes of Palo Corona, then off to the Southeast along the ridge that separates the coastal Canyons from the Garzas Creek watershed and Rancho San Carlos. It is now probably larger than 1000 acres. As a result, heavily populated Palo Colorado Canyon and surrounding neighborhoods, including Long Ridge and Green Ridge are now being evacuated. Structure protection groups are responding to the scene, in case the fire does make it into inhabited zones. 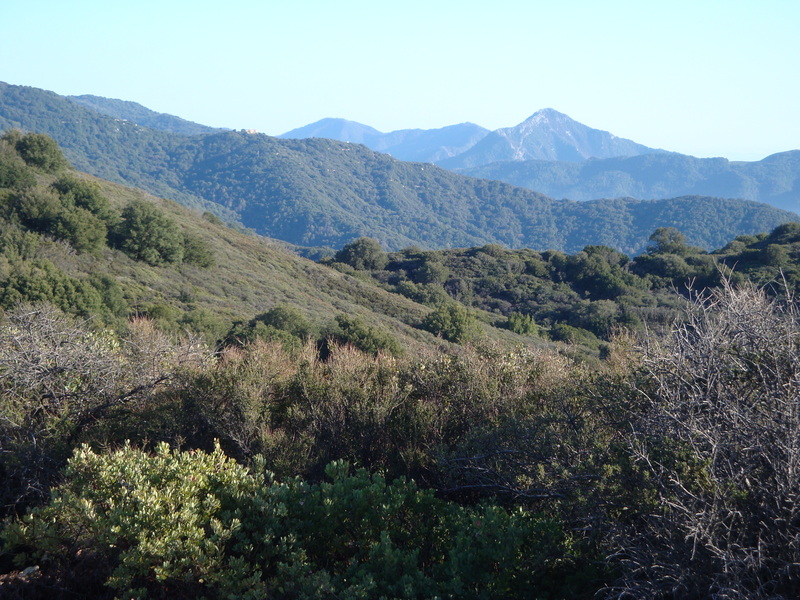 Quick, intense runs along high, dry ridges are typical of fires in the Santa Lucia Mountains. The good news is that they tend to burn down into canyons, where there is more marine influence (higher humidity) much more slowly. How far along the high ridges this fire will make it overnight is anyone’s guess, but in the direction it’s headed it could eventually reach Mt. Carmel and enter the Ventana Wilderness in the Little Sur River drainage. 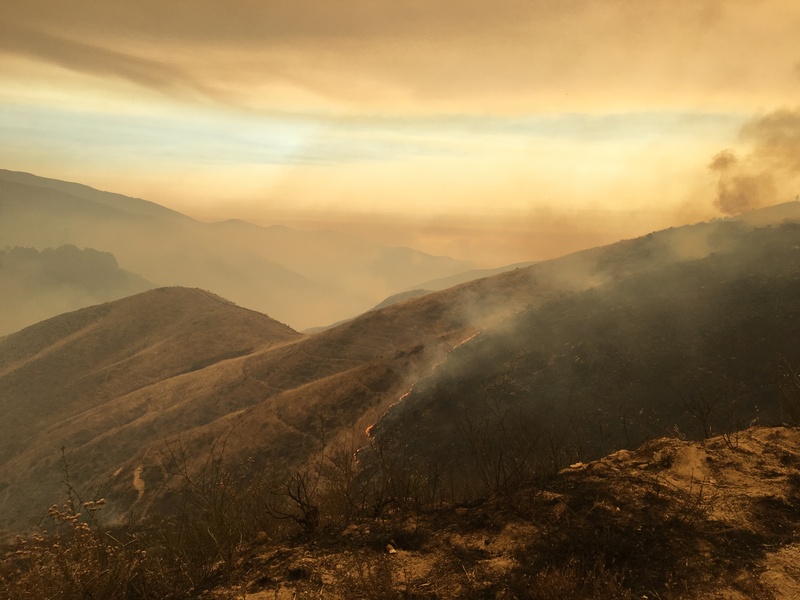 This photo of flame at the headwaters of Joshua Canyon, taken by Martha Diehl earlier this evening, would seem to confirm the movement of fire along the ridge linking Palo Corona to Mt. Carmel. View of Palo Corona from the summit of Mt. Carmel. This is the territory the fire is now burning into. Another view of the country the fire is currently burning through; this time looking south. Pico Blanco in the background. The Soberanes Fire makes its evening run; as seen from Carmel. 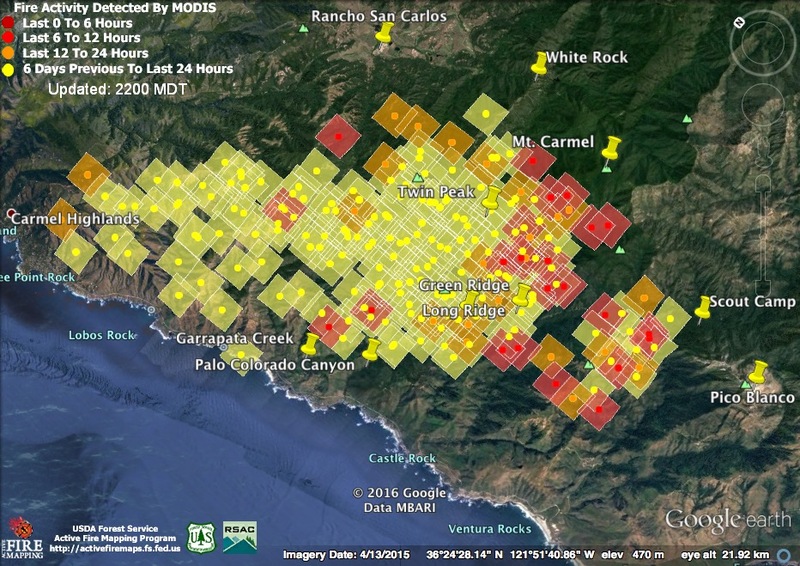 This entry was posted on Friday, July 22nd, 2016 at 11:12 pm and is filed under Big Sur, Fire, Flood & Apocalypse, Santa Lucias. You can follow any responses to this entry through the RSS 2.0 feed. You can leave a response, or trackback from your own site. As terrible as this fire is, thank you for this report. Your updates are always appreciated. Hi XT – thanks for your fire coverage. 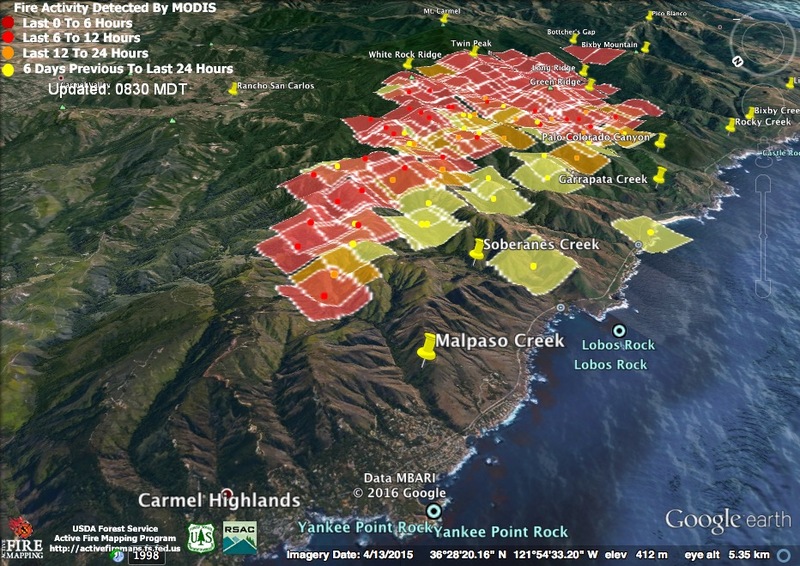 Photos and maps of the area currently burning are in various reports commissioned by the Garrapata Creek Watershed Council, http://www.bigsurwatersheds.org/plan/appendices/H_NN_2006%20report%20final_phase2_small.pdf . Wow… that is a very complete report. Anyone wanting to see and read about the area the fire ran through last night should definitely check it out. I just left Garrapata canyon about 9:30 am and I live at the very end of Garrapatos rd. The fire was definitely burning all along the north side of the canyon, very close to some of the homes up by the brush line. I suspect those are burning now. My place is down by the creek in the redwoods and it looked like the fire was pretty close but I could not see any flames. Lots of retardant raining down from Garrapata ridge, just a very surreal scene. Matt Borek was the only person left back there when I went through, getting all of his sprinklers in order. By now the flames have probably reached the creek in several spots. Thanks, XT, Kate and everyone else who is providing all this info. We are neighbors on Garrapatos Rd, next door to the (former) Taylor’s by the creek. Glad you are safe, we are anxious to hear how the canyon fared, we were planning to head up there on Tuesday. Now I don’t even know if we have a place to head to! Any information would be great. Fingers crossed. Looks like the “hot spot” detected on the north facing slope of Bixby Mountain wasn’t an error as we were hoping. And it has grown. Or maybe the same area that was back-burned in 2008 was re-lit? As of Sunday evening…does anyone know if the fire has moved down towards hwy1 between Notleys landing and Rocky Creek bridge? Just drove past there and, while the fog makes it difficult to see very far, I saw no sign of fire in that area. Thank you for the continuing coverage of how Pico Blanco Boy Scout Camp is doing. It is difficult to find information and many are hoping the camp will survive this terrible fire. Our troop camps there every summer for many years. We also help with camp maintenance during the winter including removal of downed wood and controlled burns. Maintaining the trail up to Skinner Ridge for Astronomy overnight hikes is a troop project. Our troop had several staffers evacuated at dawn on Saturday along with the campers. This always makes me think that doing controlled burns more frequently may be a way to make huge catastrophic fires less frequent. It seems to me that fuel for fire builds up for decades at a time in many stretches of the wilderness and coast. 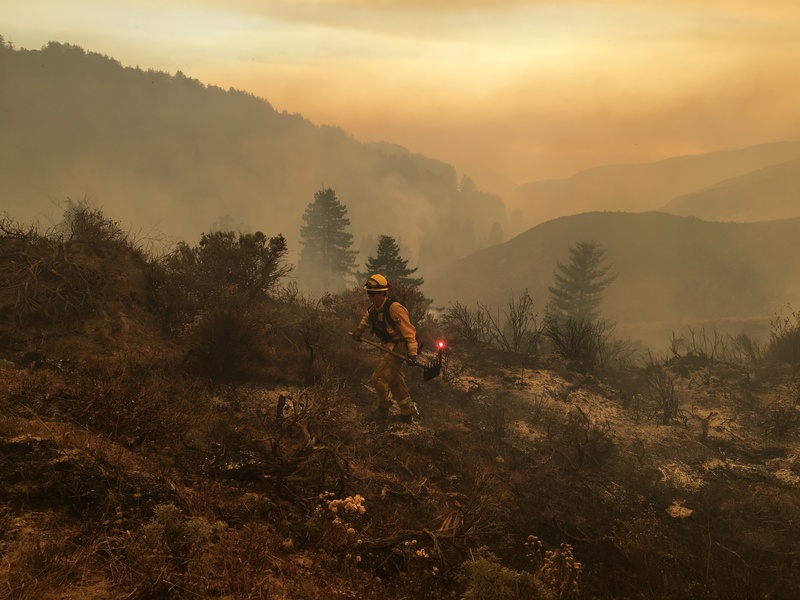 Of course you’d need a much better funded forest service to do something like that safely and successfully – and that’s a challenge these days. But in the long run, the wilderness and local homeowners would both benefit as a result. less to the point: the title isn’t what you wrote up there – it’s actually “The impact of antecedent fire area on burned area in southern California coastal ecosystems” – and amazingly enough, the study itself is no longer available for download in the link you posted, so I can’t actually read it. But thanks anyway, I suppose. And while the bullet points from where you pulled the erroneous title appear to reach the conclusion that prescribed burns do not impact total wildfire area in Southern California, they also state “Prescribed fire may have more impact with management strategies designed to reduce ignitions, or to encourage planning decisions that minimize the spread of fires into urban environments” – i.e. 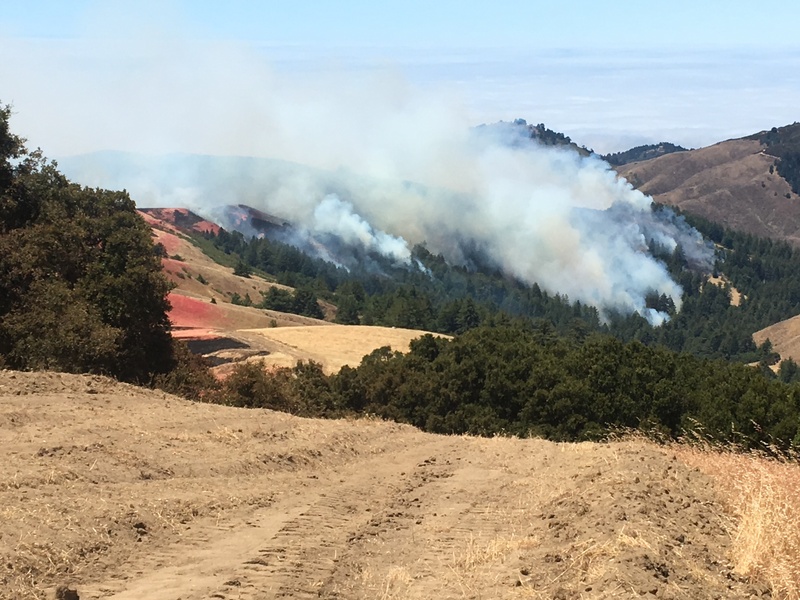 that prescribed burns may be an effective means to reduce potential fuel – which is basically what I said. Sam Foster, what in the world are you talking about title here ? Did you even click on the link ? That’s the exact title. That second bullet point is with reference to urban environments, not wilderness remote areas like Big Sur. I’m not going to dicker and quibble in definition shell games here, so here are some ore links from the Chaparral Institute who actually posted that link. This one is from the US Forest Service land Ecologist Marcia Narog. That entire Central California coastline is loaded with some invasive species already like Jubata grass (Cortadaria jubata) otherwise known as Pampas Grass on the steep ocean side slopes mixed with massive amounts of Poiso Oak. It would almost be impossible to control burn such an area and that’s not what tourists want to see when they go visit there. More is involved here than chaparral. You clearly ignored bullet point #3 which applies directly to an area like Big Sur’s coastlie. Hi – I did click the link and looked it over carefully. The ‘title’ you misquoted is the * heading * on the “brief” or abstract which summarizes the article * not * the paper itself, which actually has a very different title. Also, the full article is definitely not available on the link you sent while the summary is – and that’s what you’re looking at and referencing – the summary and not the full paper. Well here is an entire page of links, aside from the great video which features fire ecologist Jon Keely who is interviewed. Here is the other page with the video, but scroll down below. I lived in the San Jacinto Mountains for over 20+ years and the control burns they did accomplished nothing in the wilderness areas there. Often they got out of control and killed the forest they were trying to protect. Neither CalFire [California State Division of Forestry] nor the US Forest Service could ever agreed on anything. 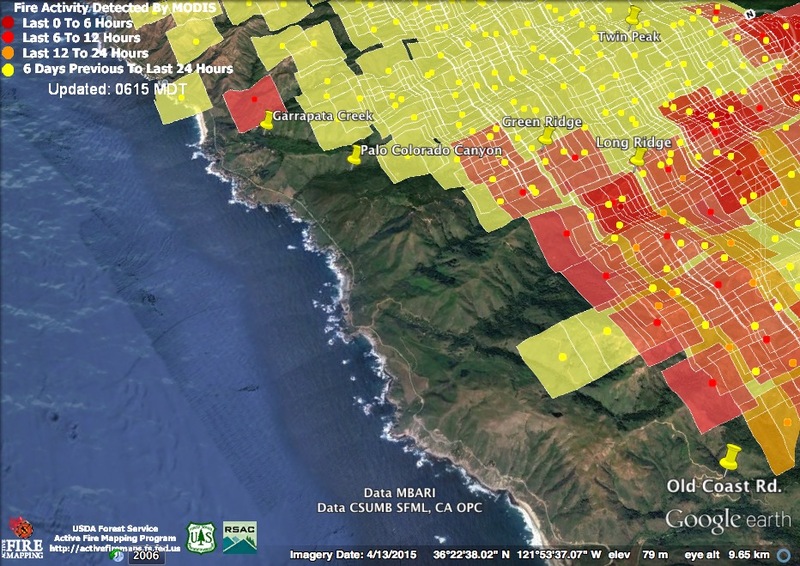 But the bottomline is that control burns in this pritine Central California Coastline would not benefit and tourists do no want to see charred hills and scenary anyway. And for the people that live in such dense habitats with dead end geography, that’s just the risk you take in chosing to live in such a location. I always accepted what could have been inevitable one day. cool – will take a look and read later, thanks.